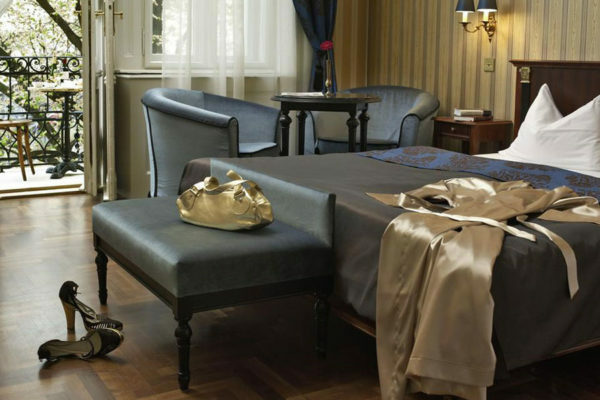 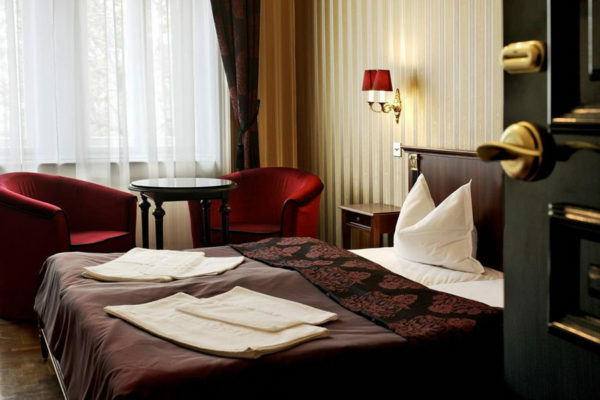 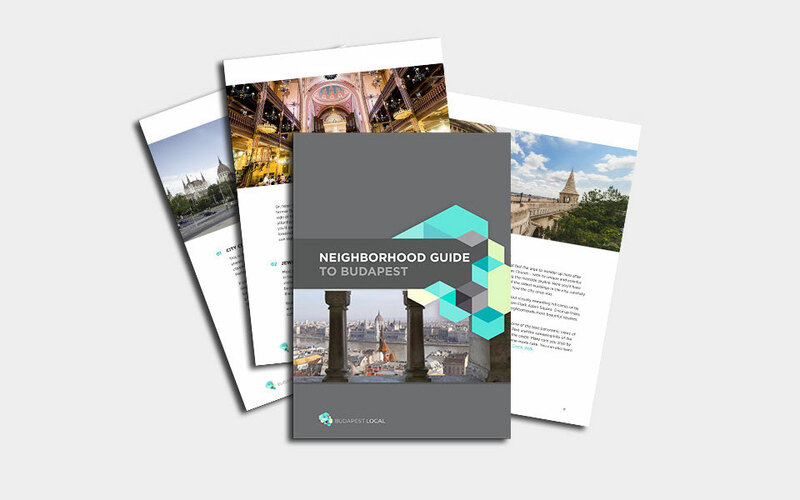 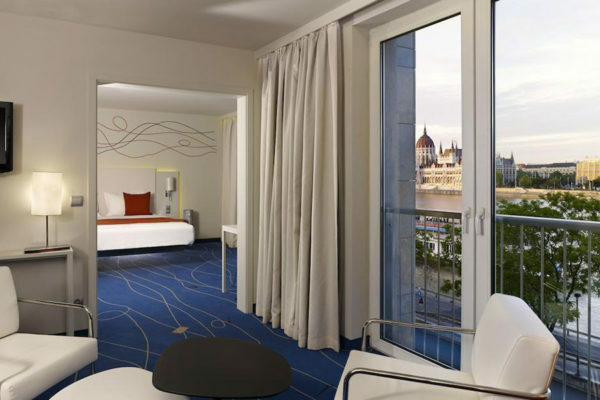 Did you know that there are thousands of hotels and other accommodations in Budapest? 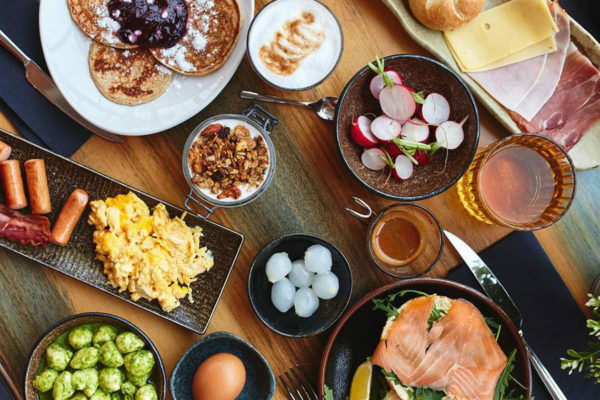 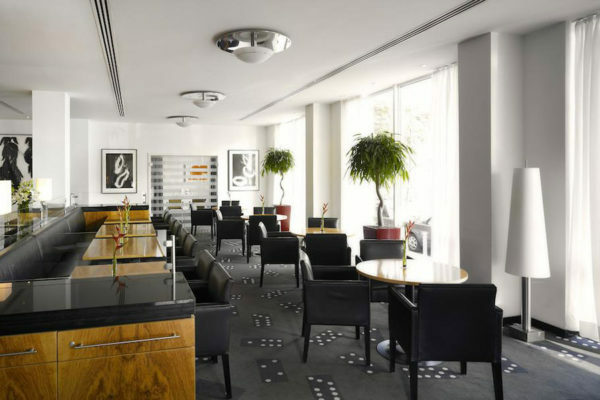 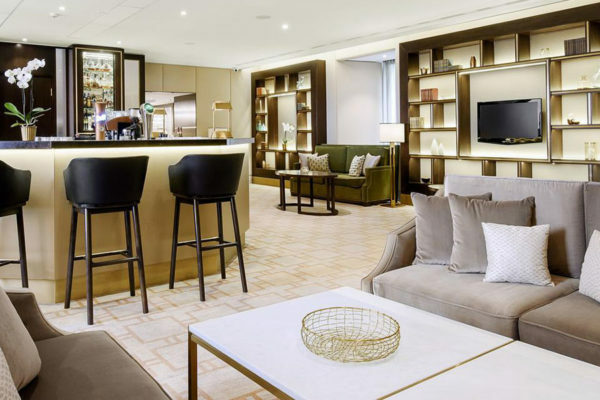 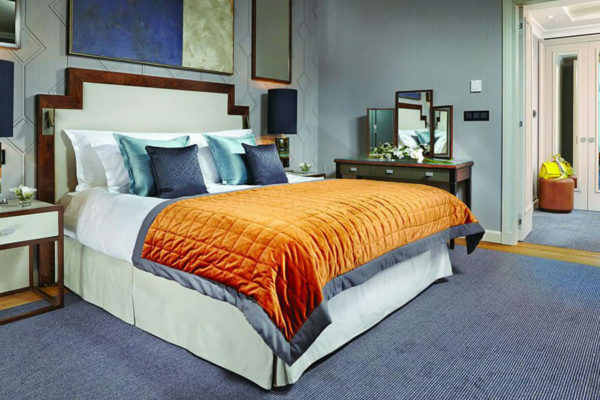 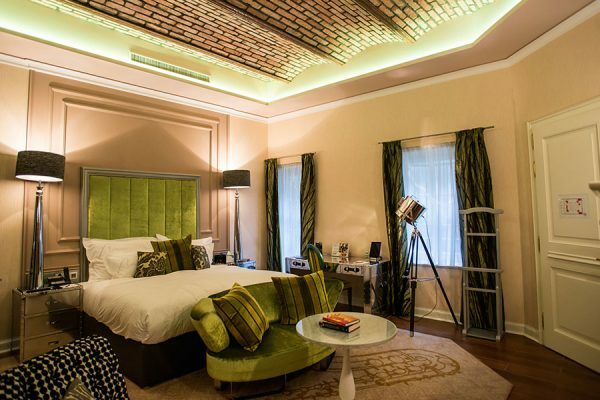 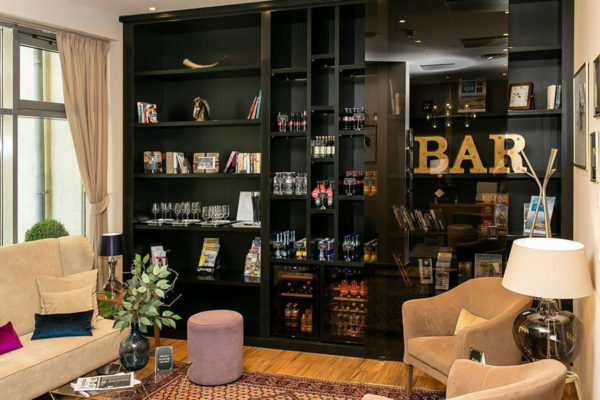 If you don’t want to spend hours looking for the best place to stay at, then check out my recommended hotels in the city – all centrally located and within walking distance from the best cafés, bars, restaurants, the main sites, museums and more. 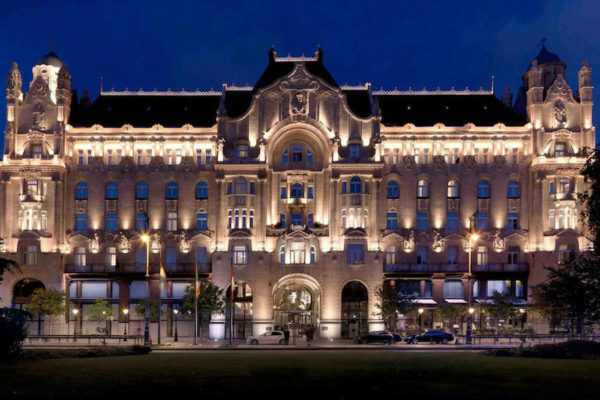 Have a great stay in Budapest! 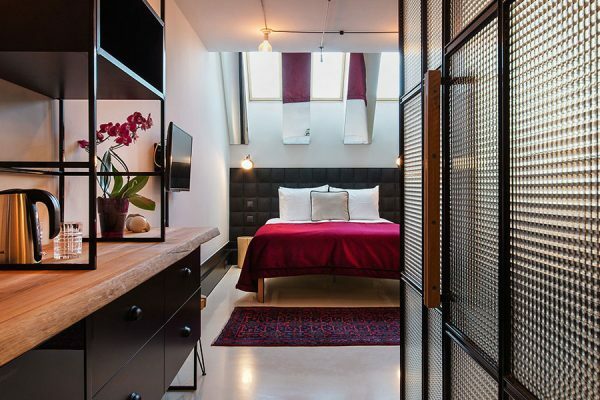 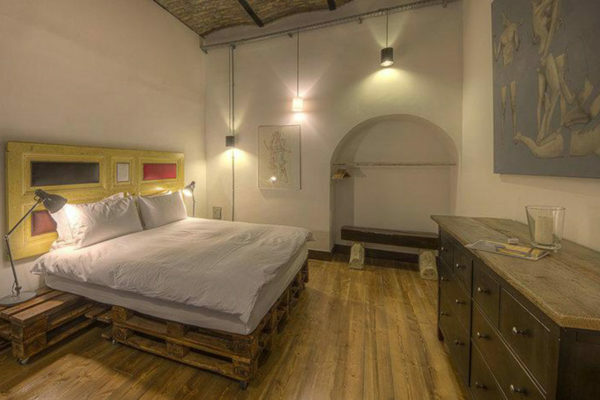 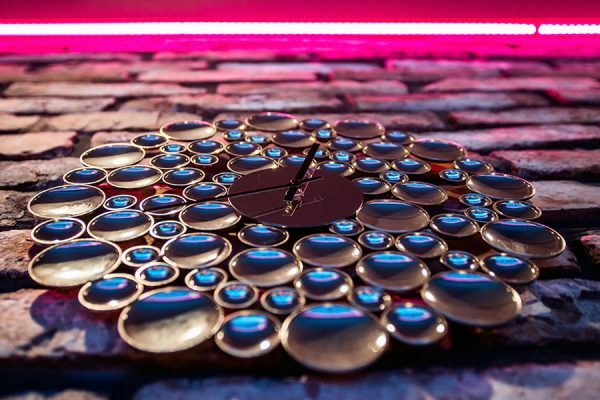 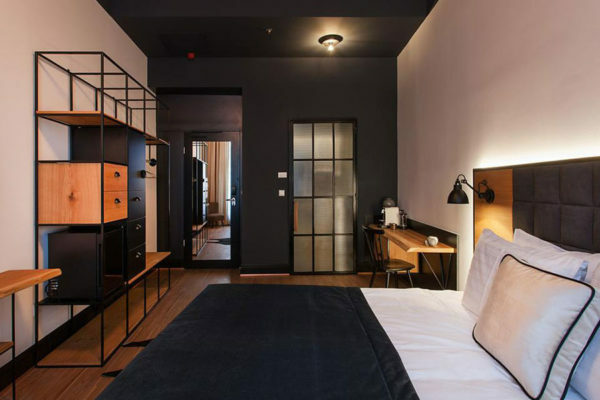 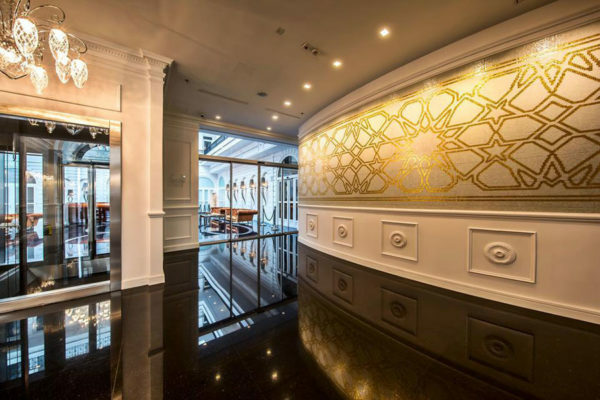 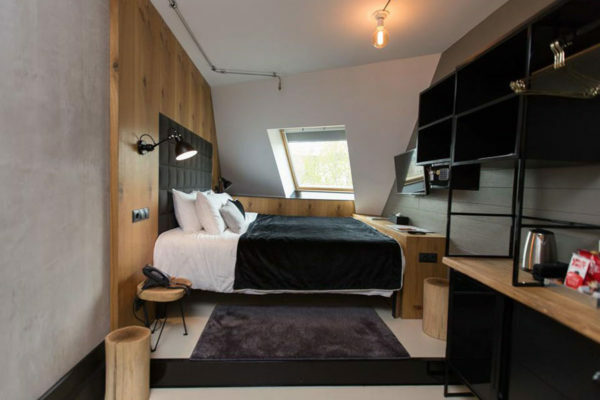 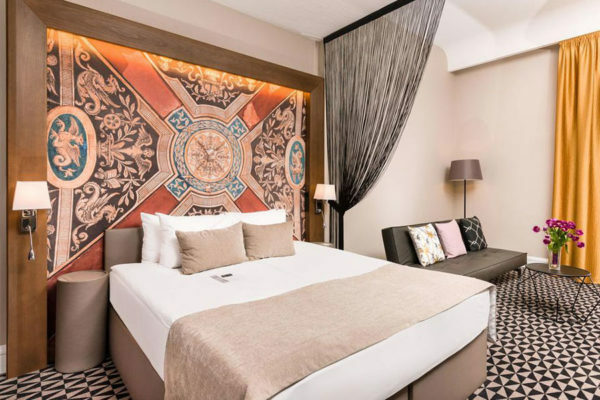 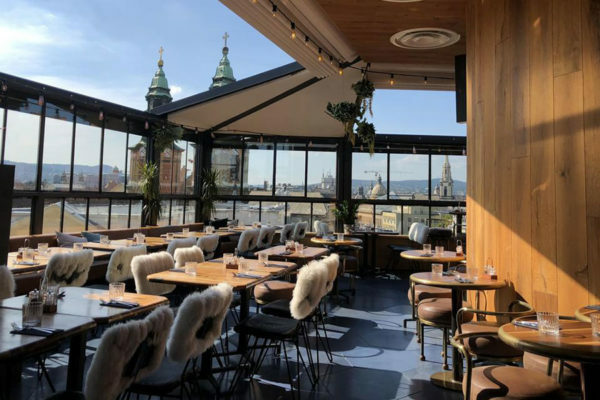 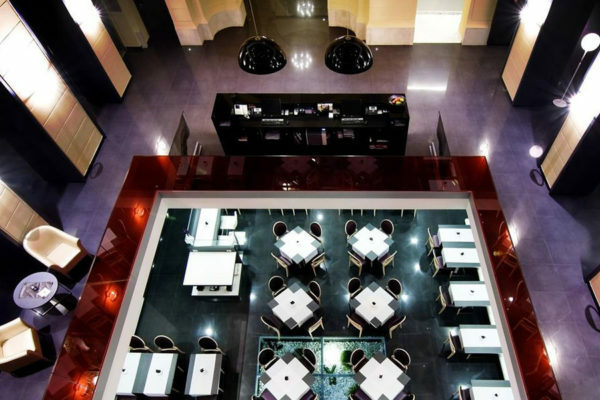 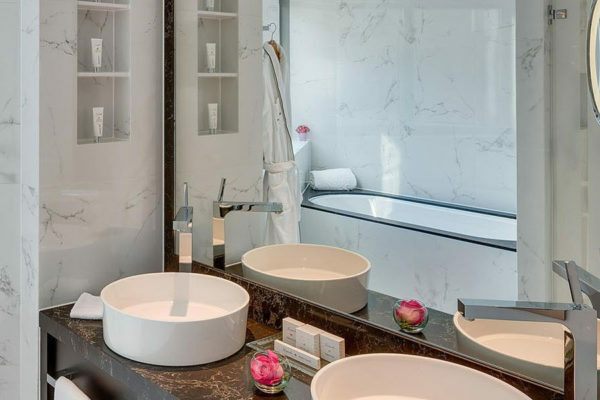 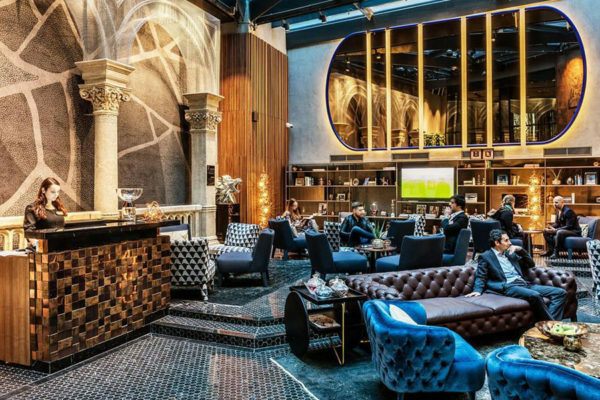 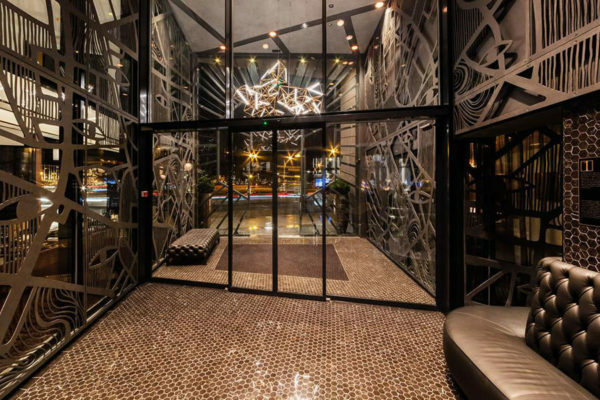 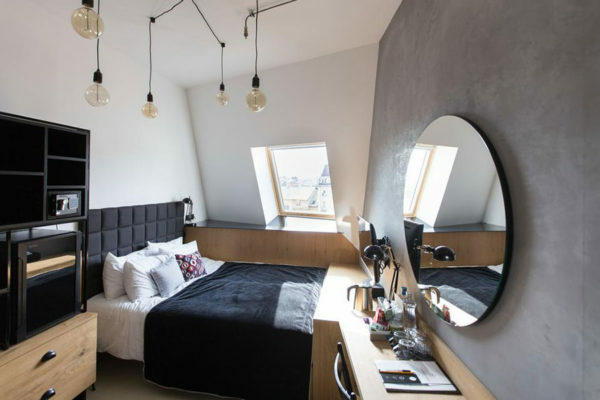 Modern, minimalist decor and a breathtaking rooftop bar await you at this boutique hotel tucked away within the gothic churches and university buildings of the 5th district. 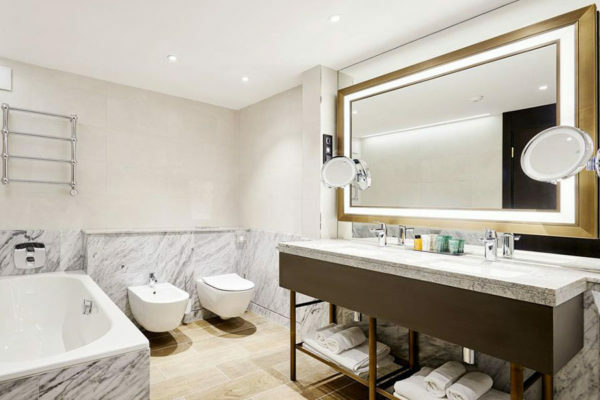 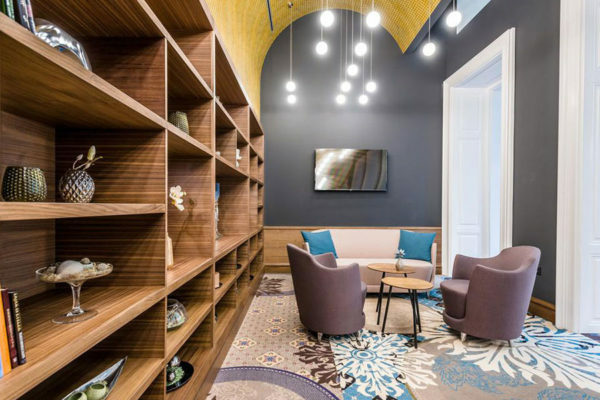 This old townhouse turned hotel still leaves traces of its original structure and design while creating a contemporary and bolder approach. 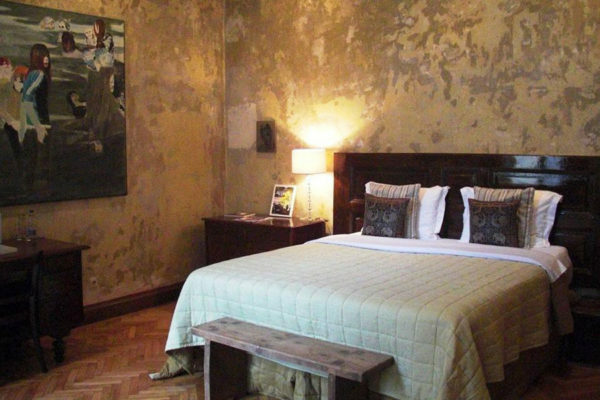 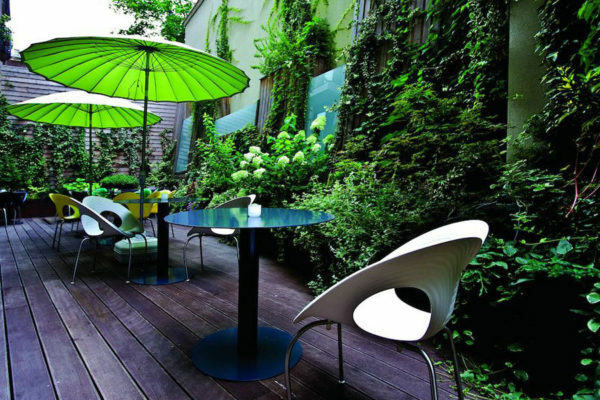 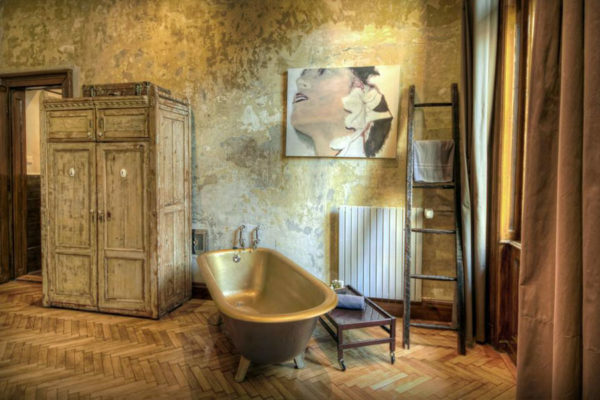 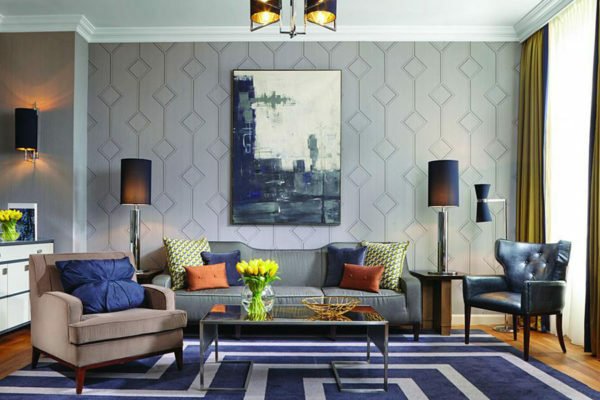 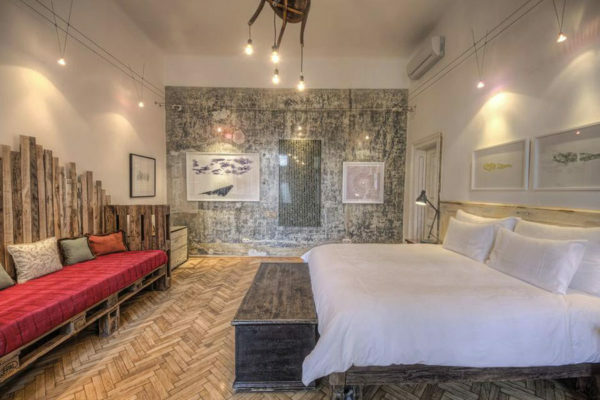 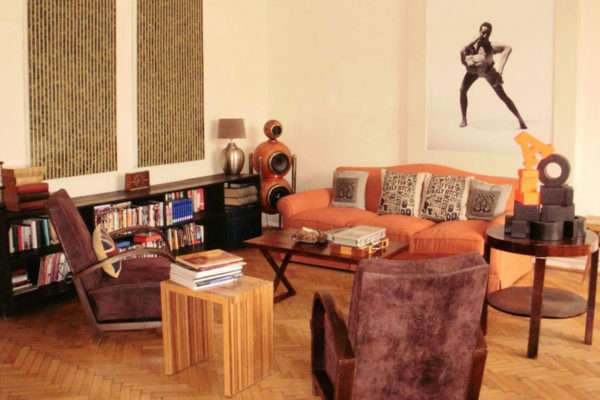 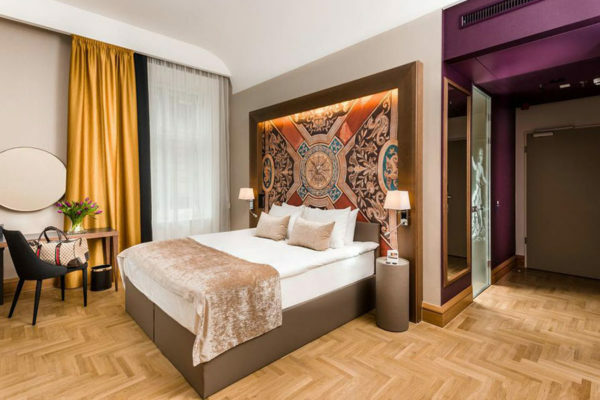 Boho chic meets artist’s residence at one of the most popular hotels in Budapest. 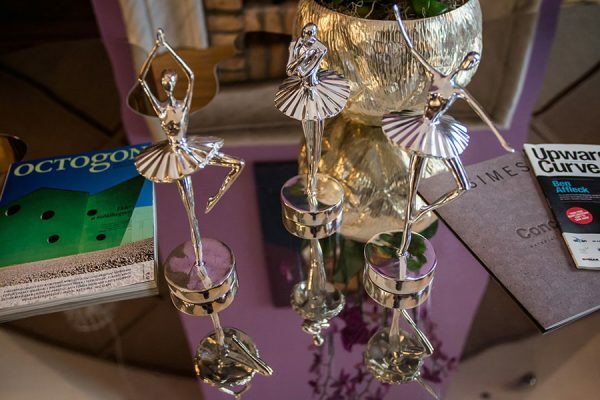 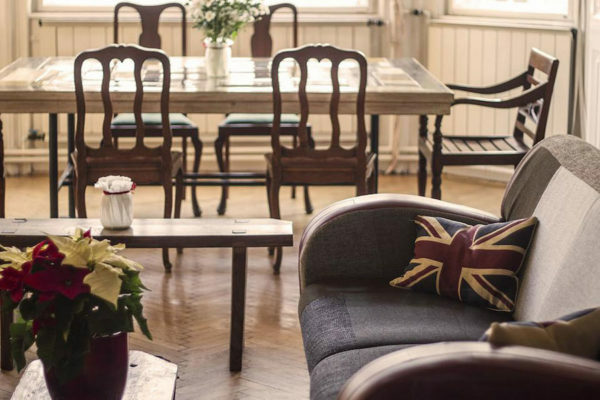 From upcycled furniture to quaint décor, it’s no surprise that Brody House plays host to artists calling Budapest home while shooting a feature film or modeling in a fashion shoot. 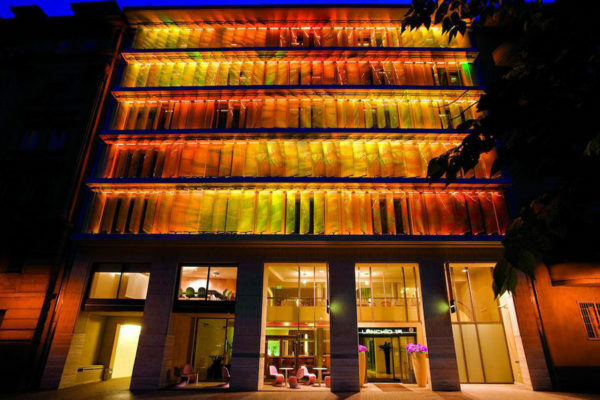 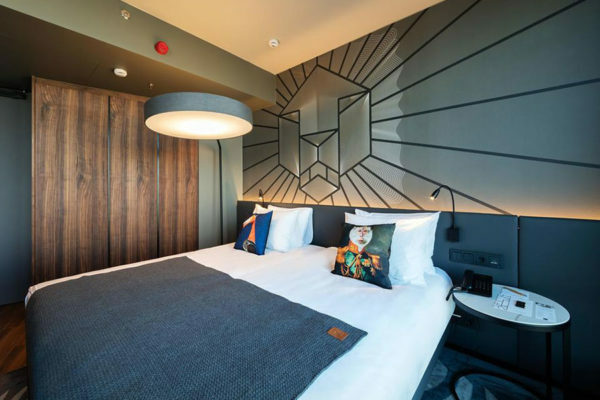 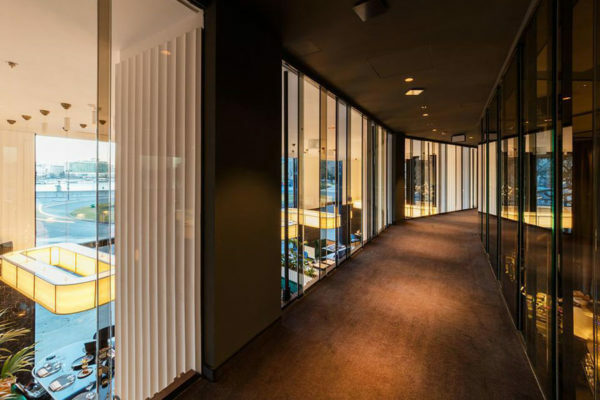 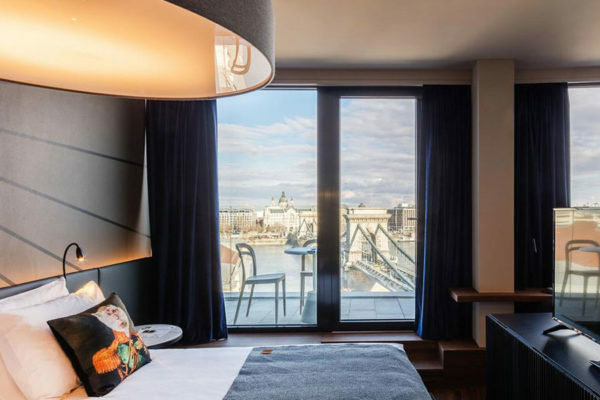 Situated on the banks of the Danube on the Buda side, the multi-award winning and newly renovated Lánchíd19 Design Hotel is carefully crafted and it’s hugged by an undulating glass exterior that basks in natural light by day but is illuminated by colored lights by night. 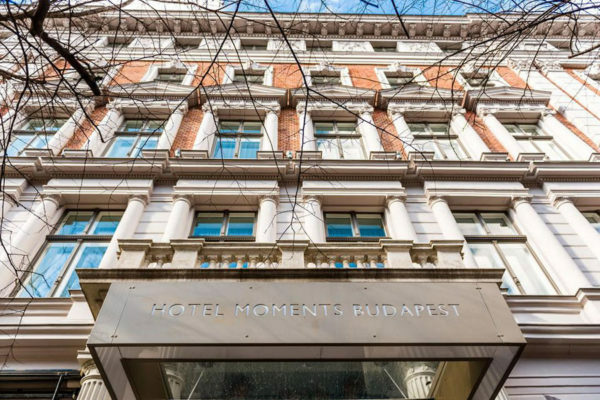 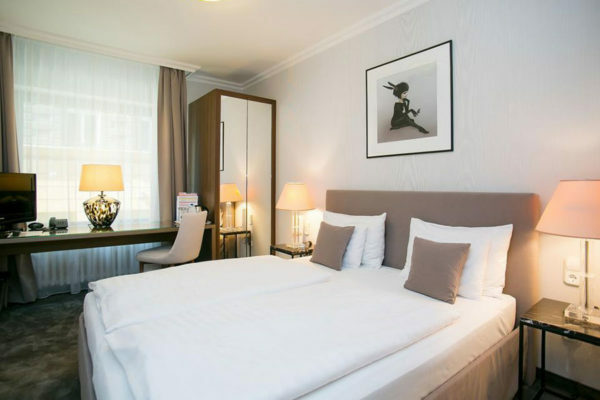 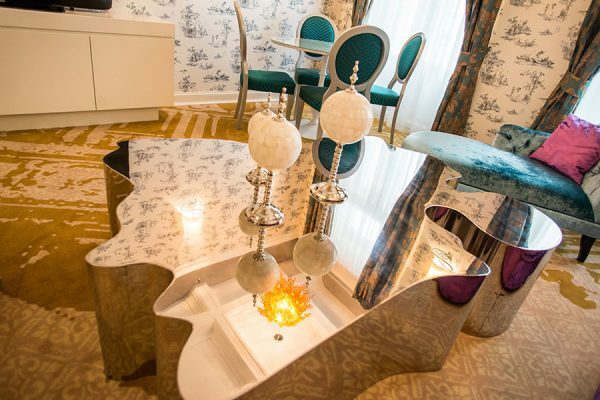 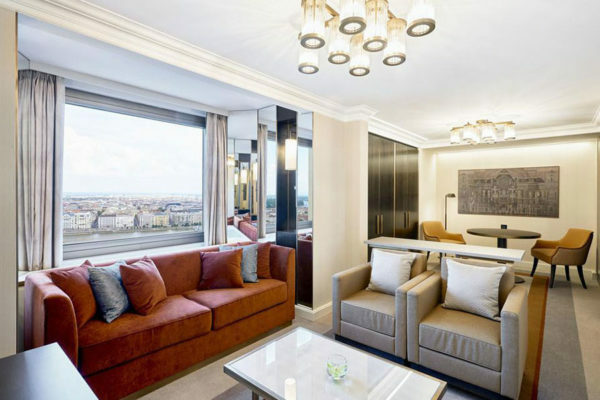 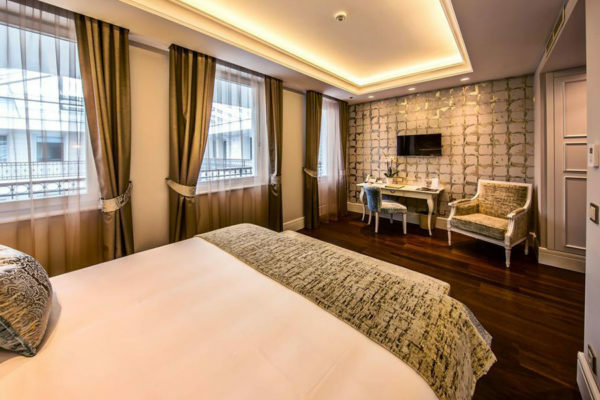 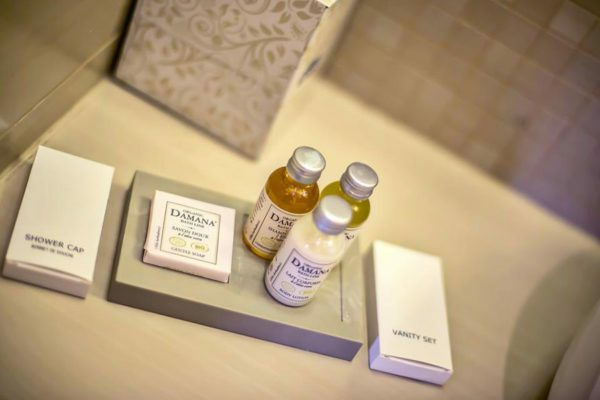 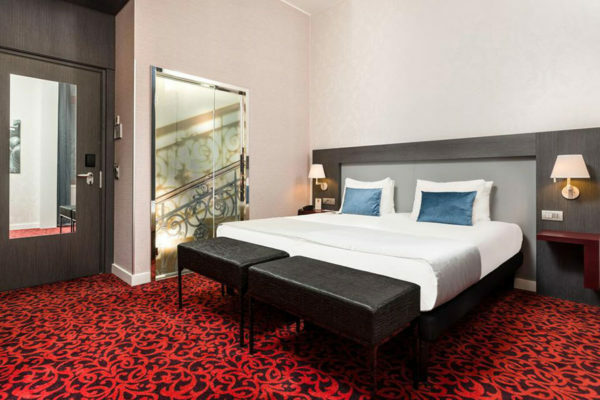 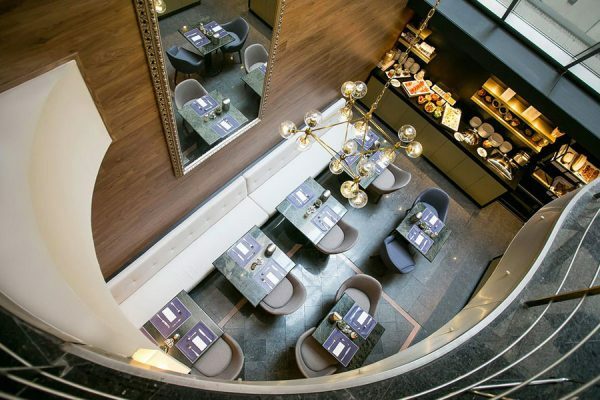 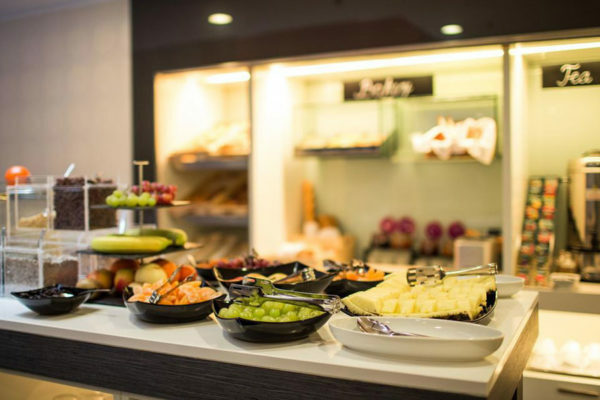 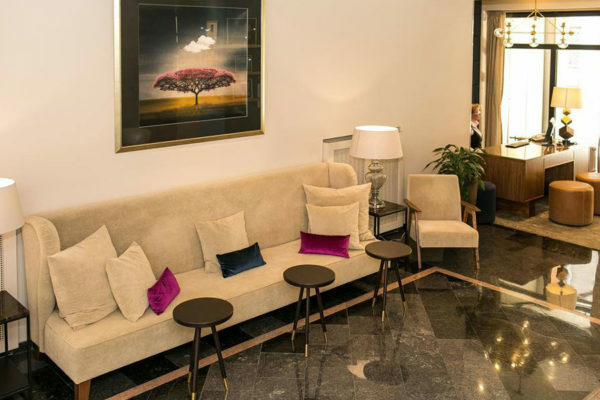 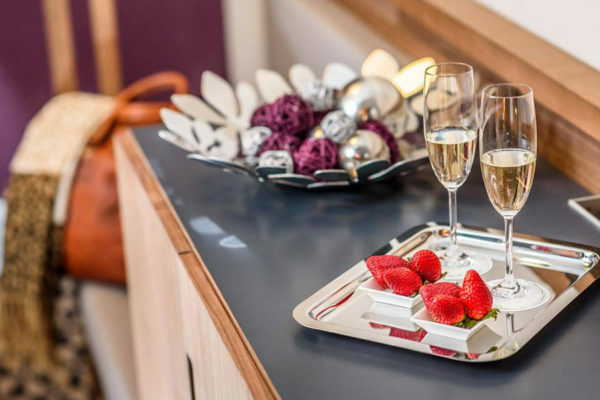 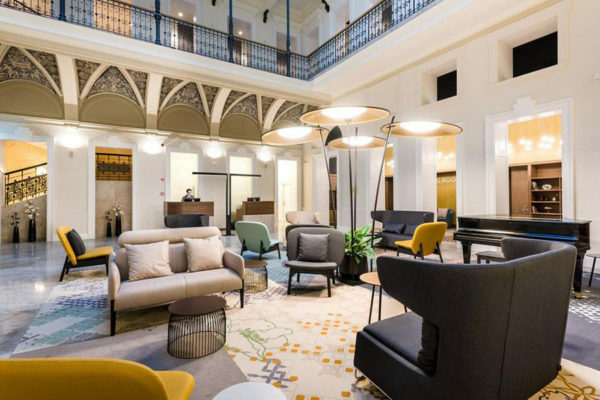 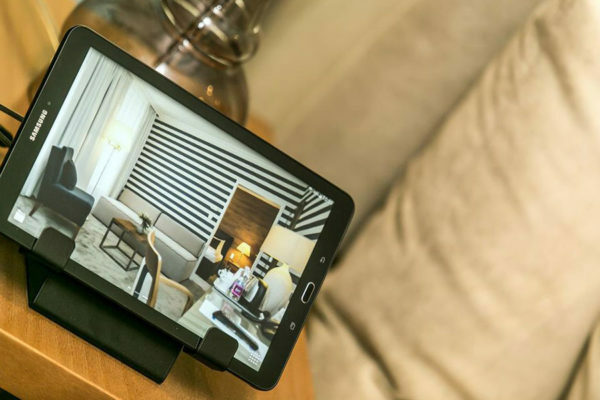 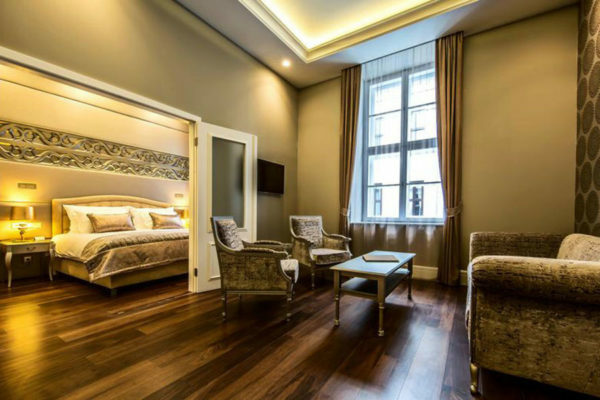 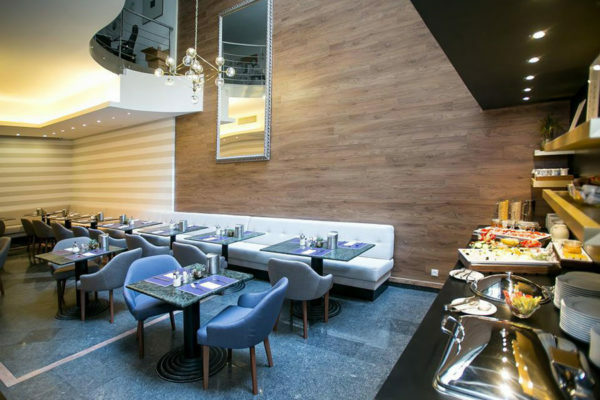 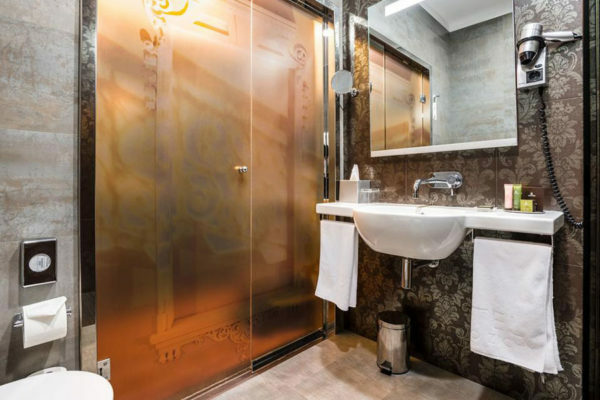 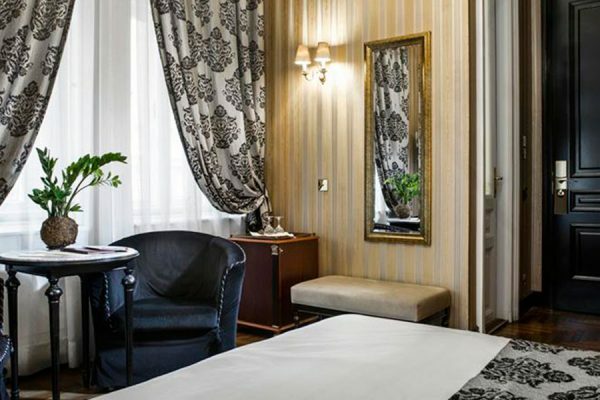 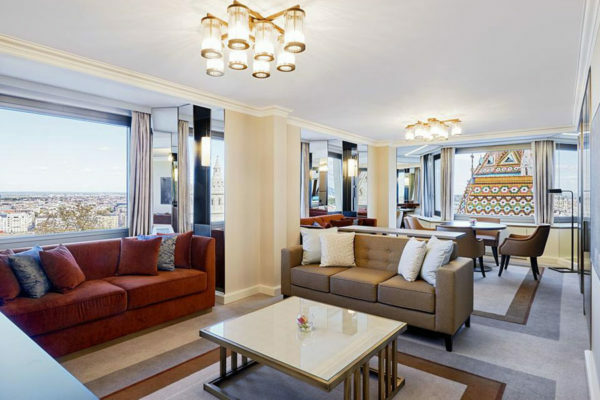 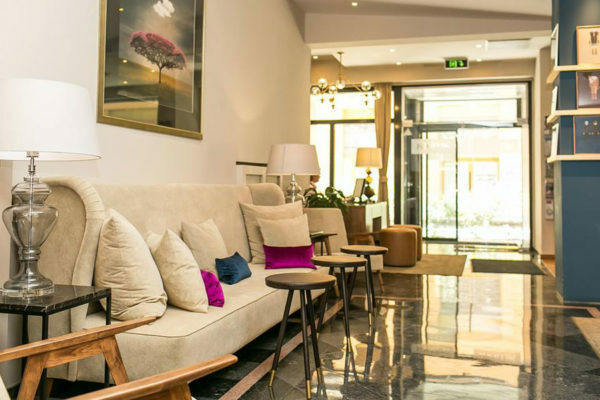 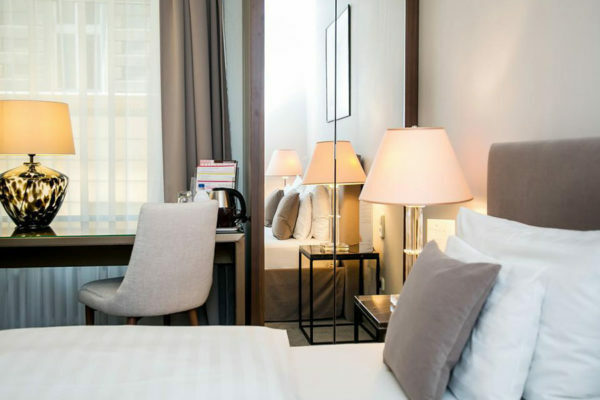 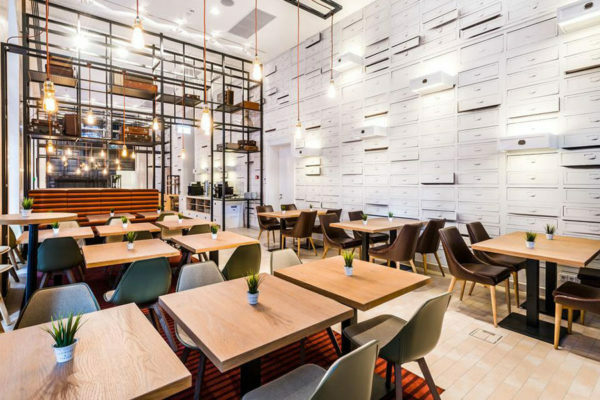 Located within the stunning rows of neo-Renaissance buildings and upscale shopping of Andrássy Avenue (also a World Heritage Site), Hotel Moments is ideal for travelers wanting to be in the heart of the city center. 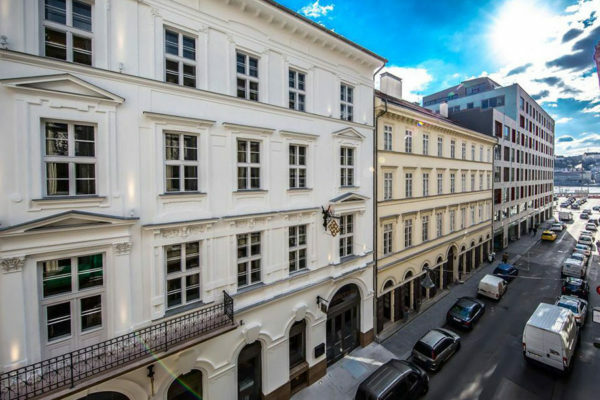 If these 19th-century palace walls could talk they would tell you of their days as the city’s first cinema, a hardware shop, a bank and a series of nightclubs. 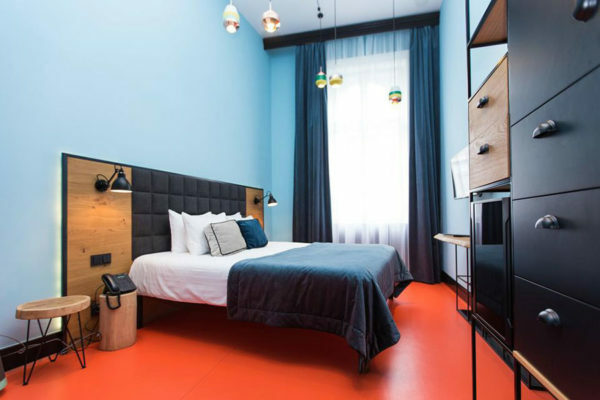 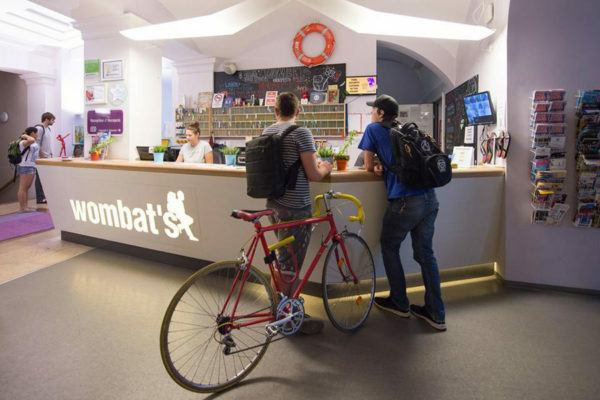 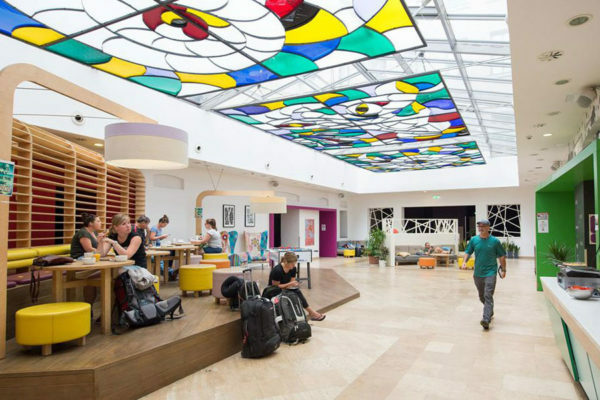 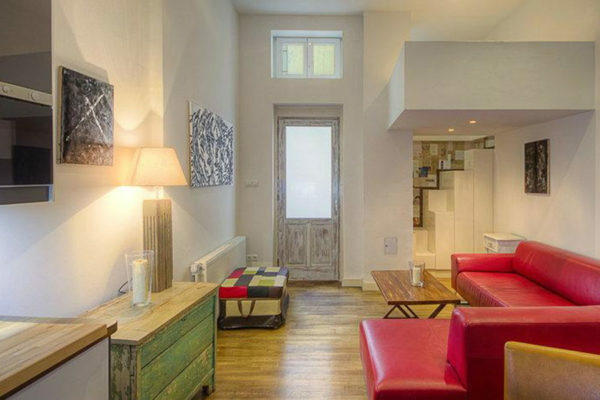 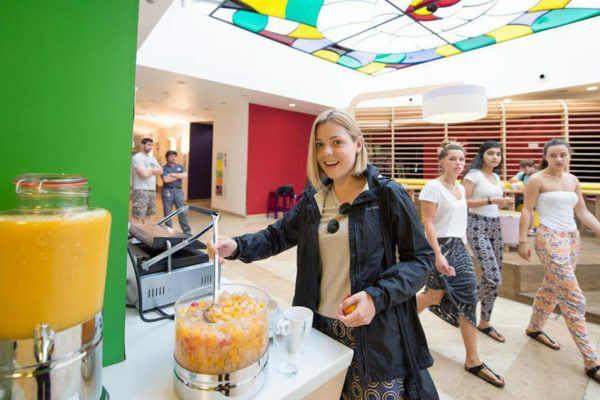 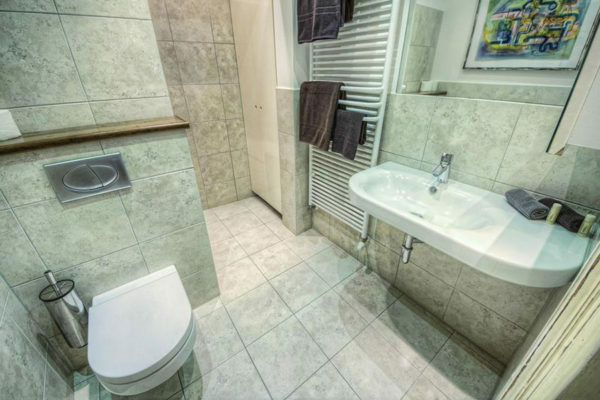 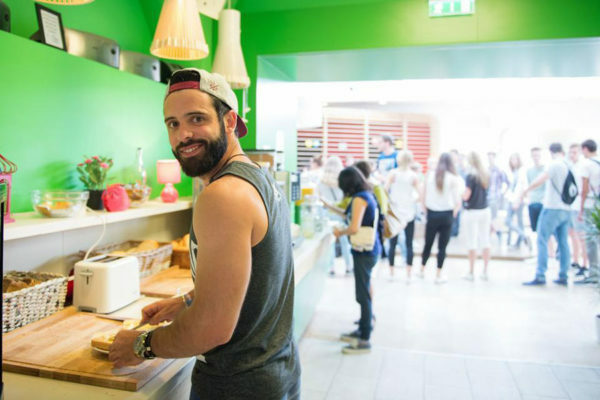 If you’ve already stayed at one of the Wombats Hostels in Berlin, Munich, Vienna or London, you know that they offer great service for a very reasonable price. 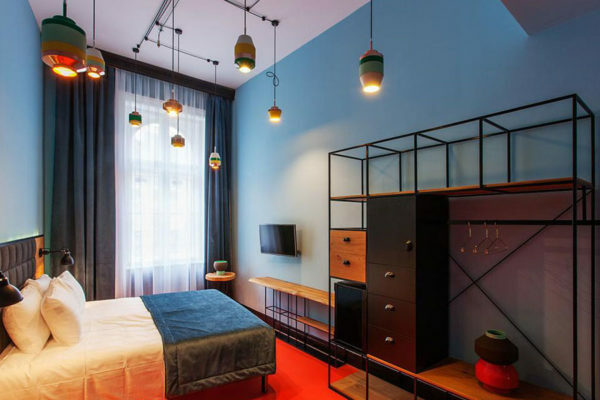 The Wombats Hostel in Budapest is no different. 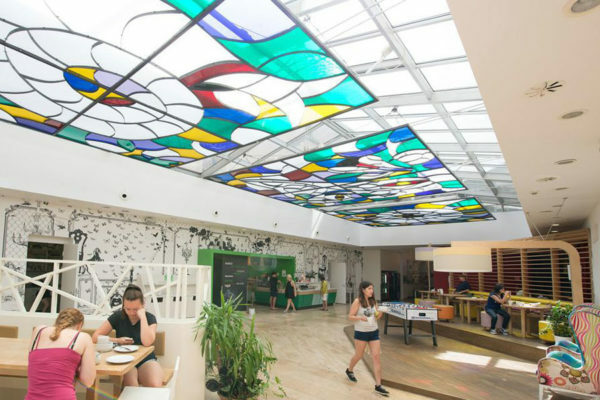 They are located on Király Street on the edge of the Jewish District and right in the middle of the city’s buzzing night life with the exciting ruin bars. 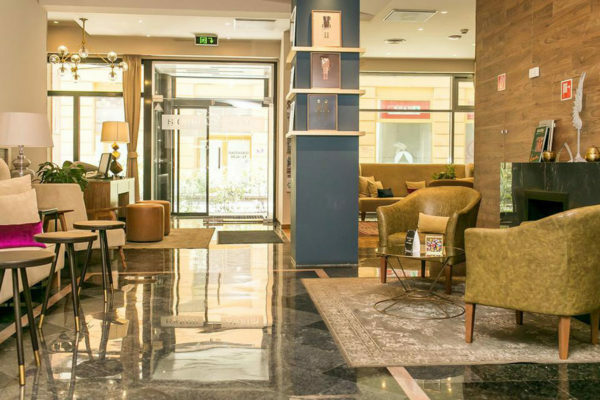 If you stay at Wombats, you’ll also be in the very center of Budapest within walking distance from some of the best cafés, restaurants, museum and more. 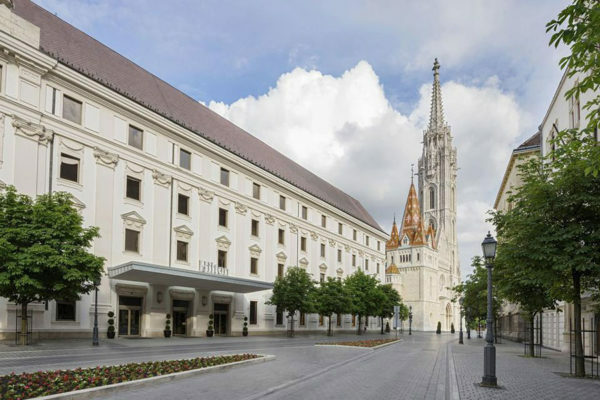 While you could choose the Hilton that’s right in the cosmopolitan bull’s eye of the Pest side, if you are looking to escape and enjoy a more unique Hilton experience then this 13-century church turned hotel situated on quiet but beautiful Buda in the popular Castle District is sure to provide you with the relaxing retreat or romantic getaway you’ve imagined. 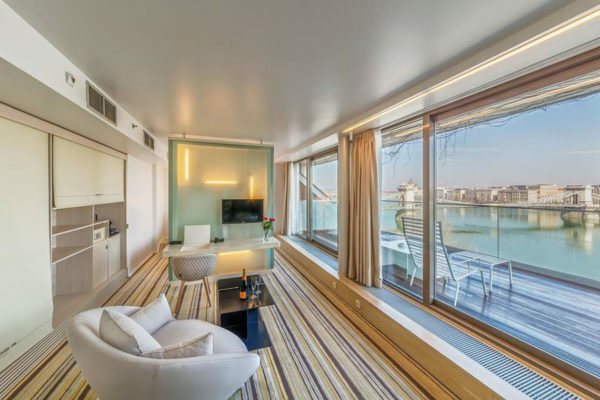 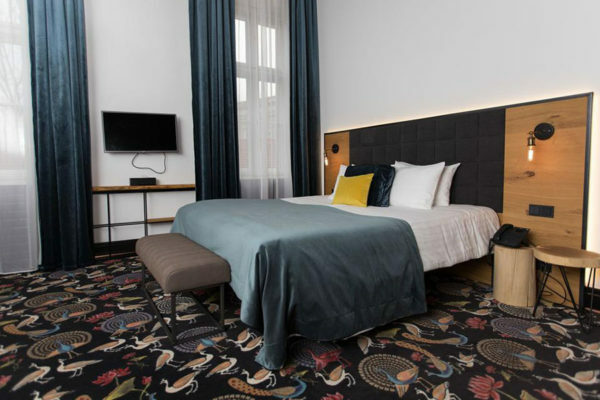 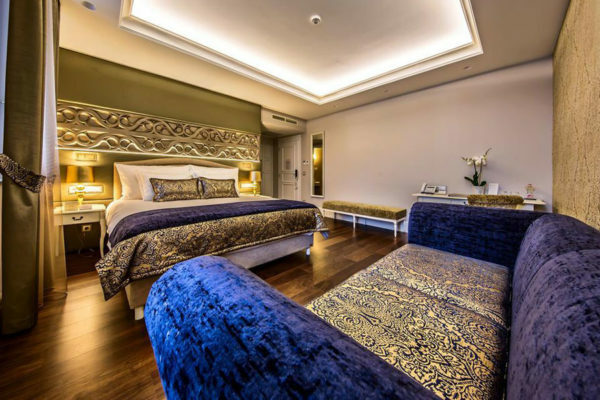 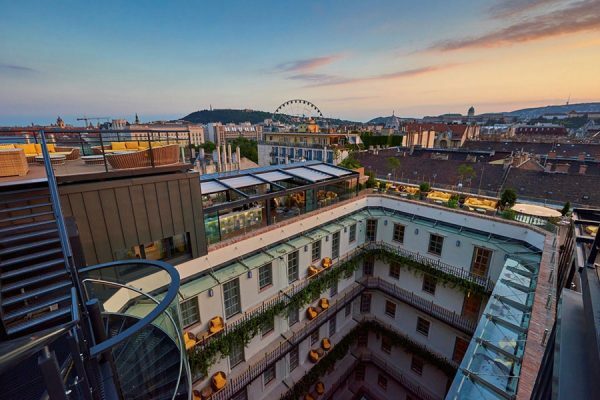 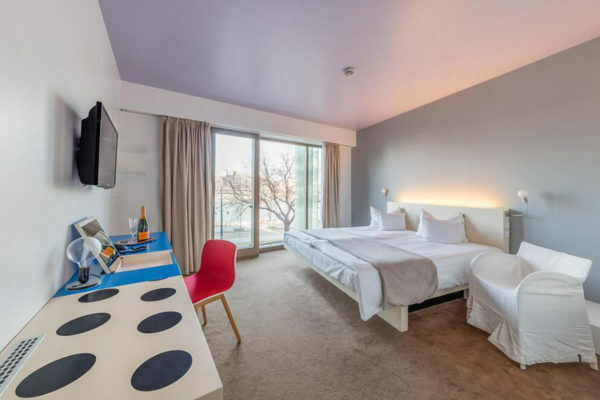 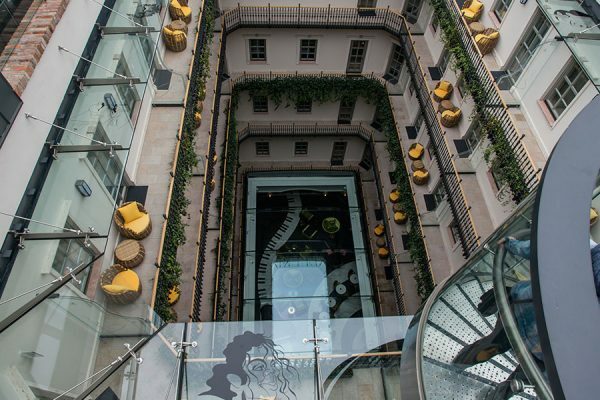 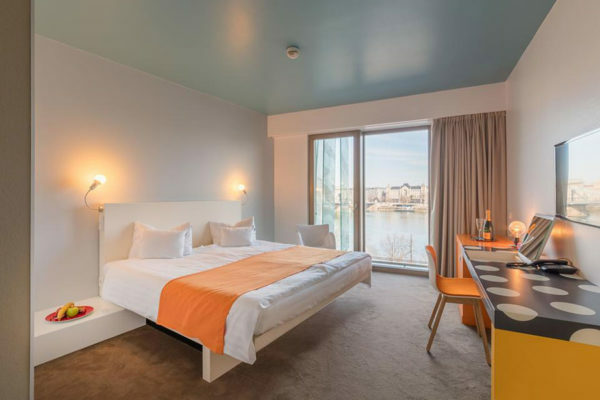 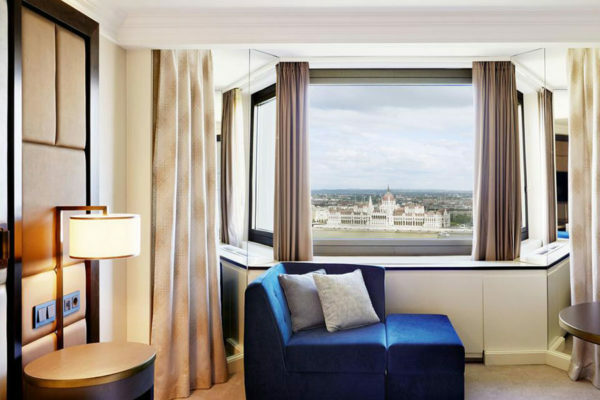 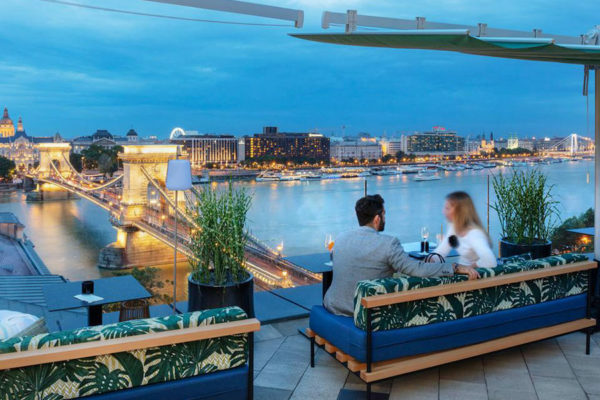 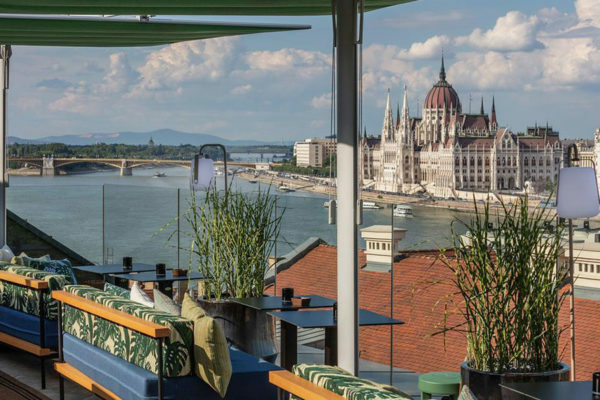 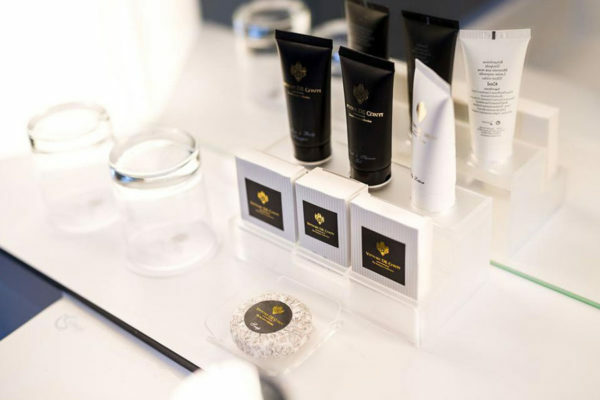 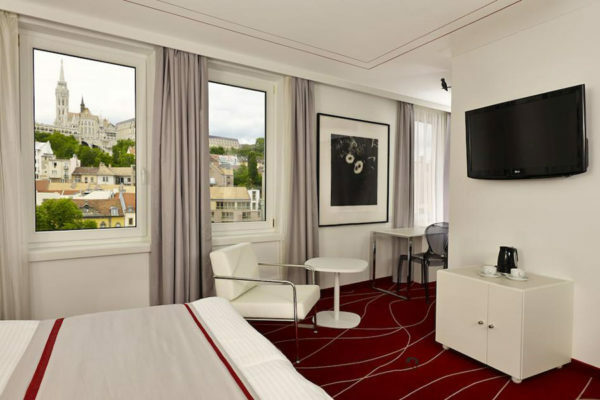 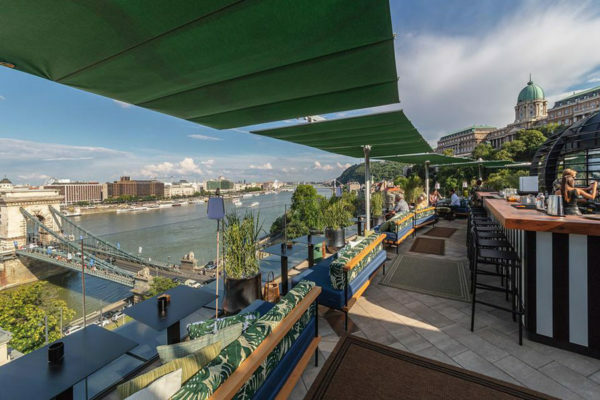 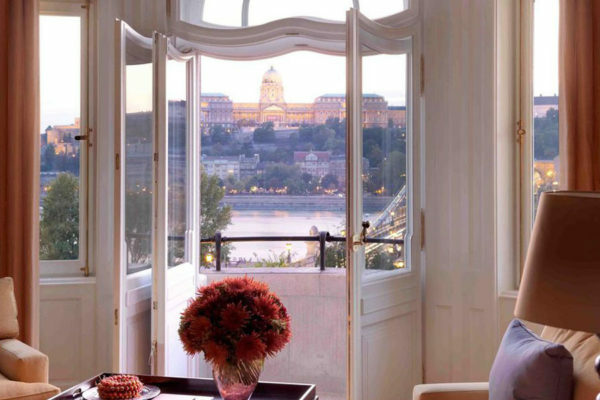 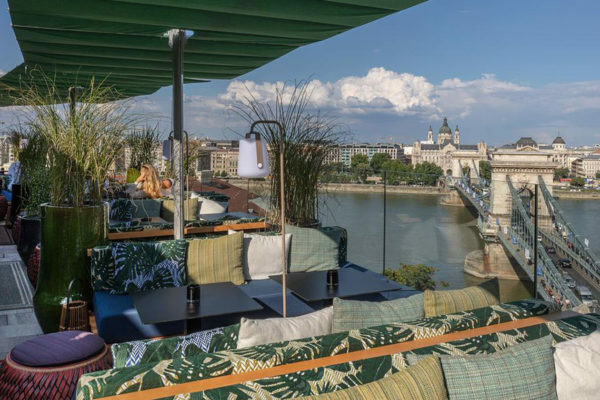 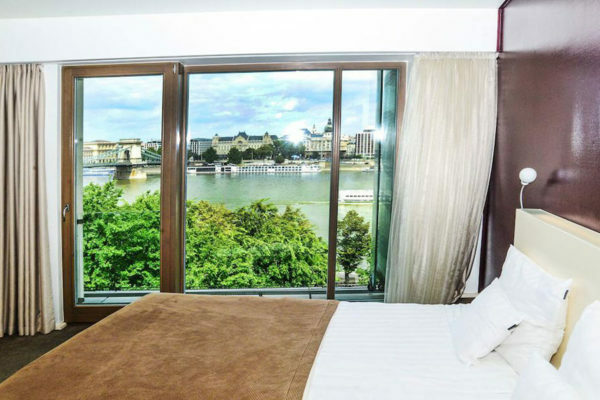 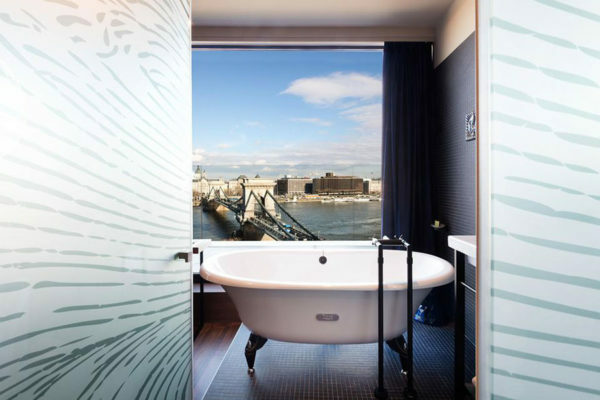 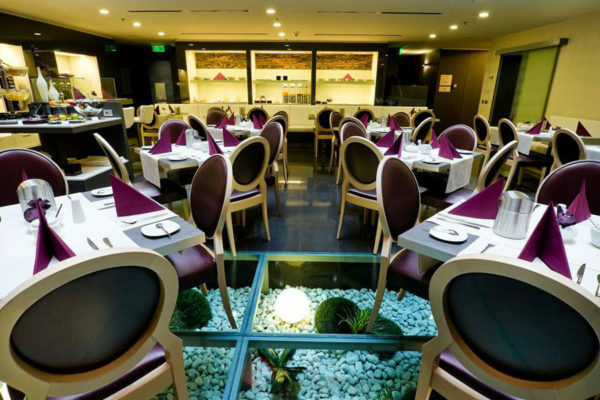 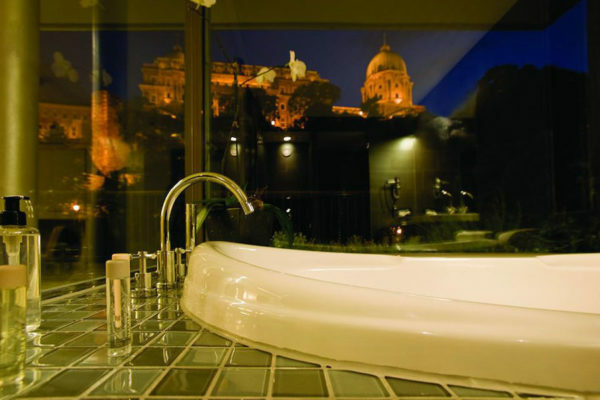 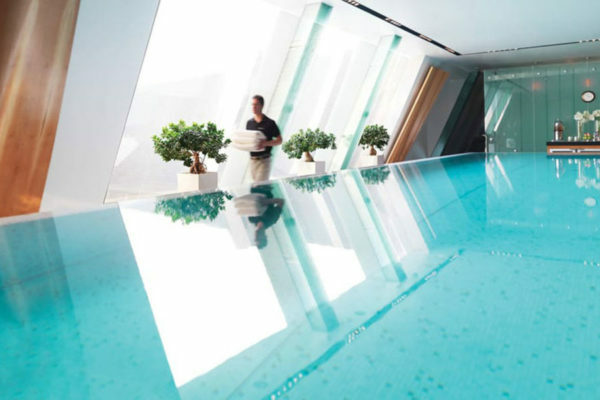 Hotel Clark truly offers the best of both worlds, being that it’s housed on the Buda side but Pest’s array of attractions are just over the Chain Bridge. 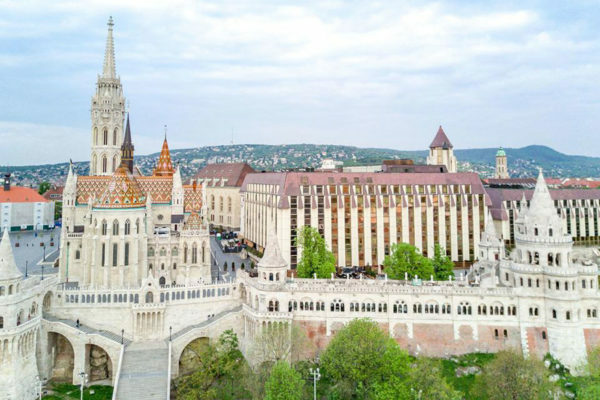 Enjoy a morning trek to Buda Castle and Fisherman’s Bastion, two top attractions in the Castle District. 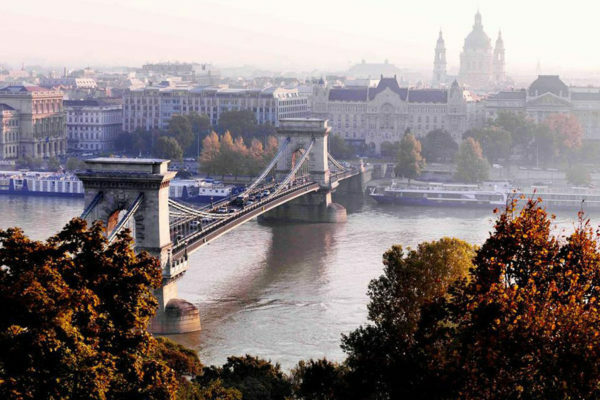 After which, you may want to tackle the famous Gellért Hill for what some say offer the best views of the city. 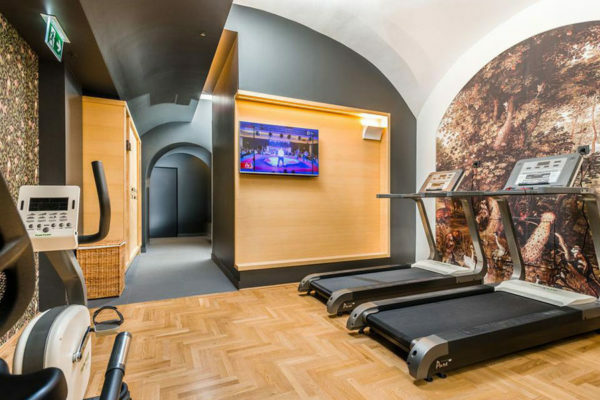 Who says the Pest side has to have all the fun? 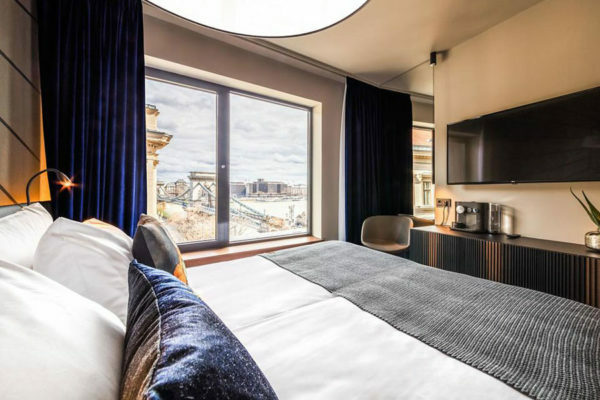 Enjoy the serene beauty of the Buda side with incredible views of Pest and the Danube River when you stay at the art’otel Budapest. 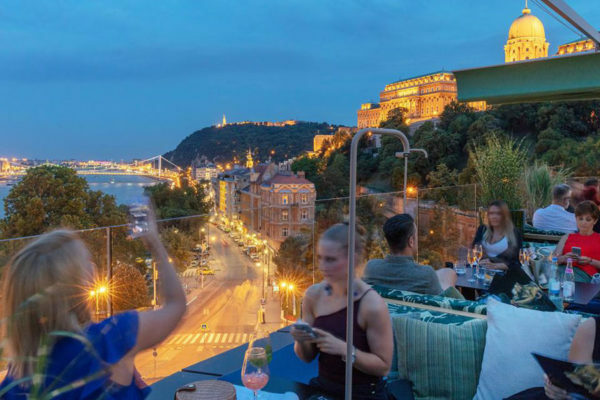 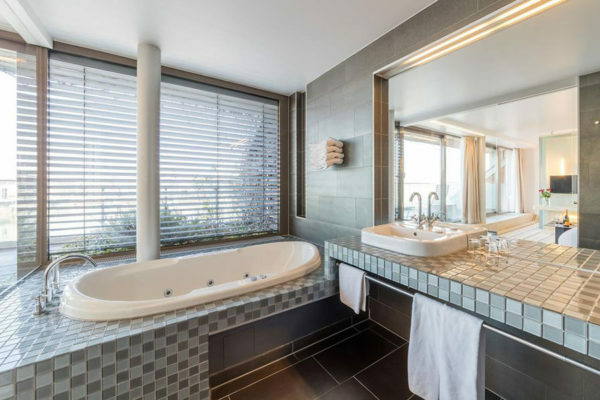 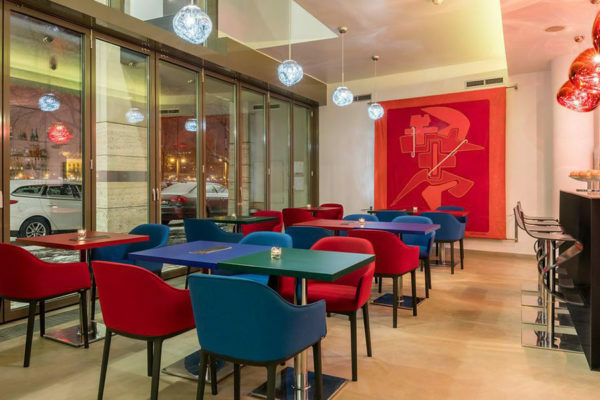 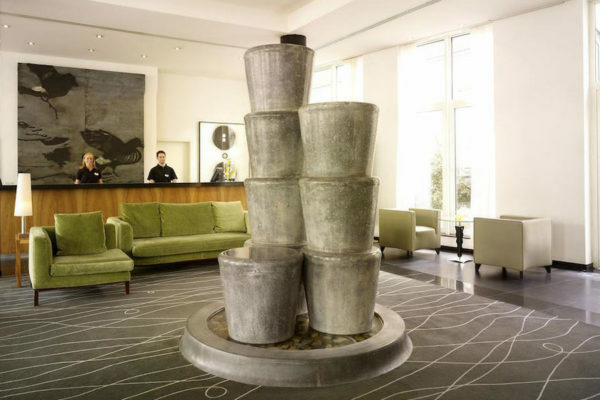 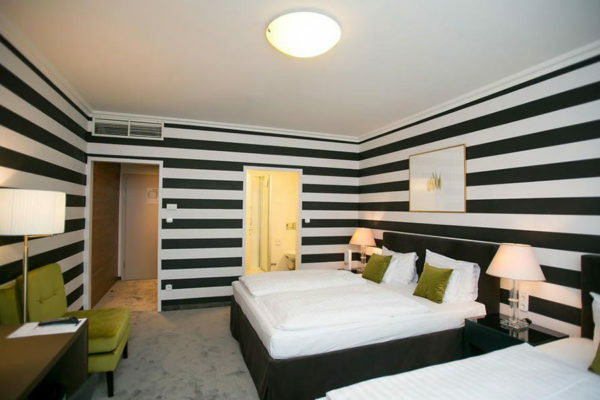 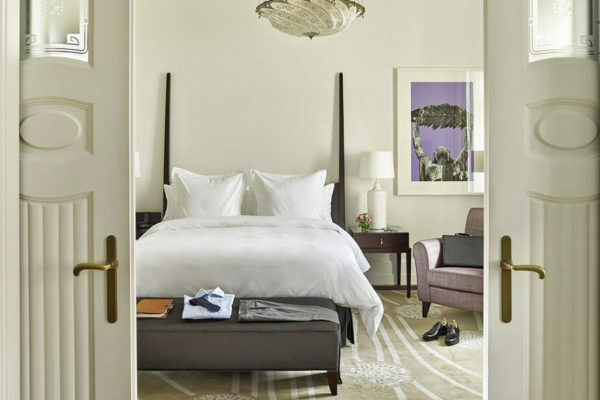 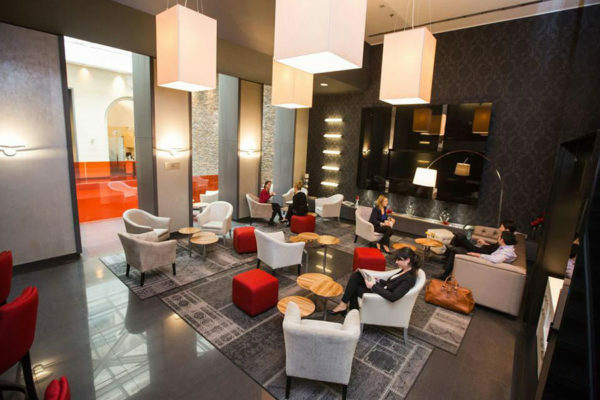 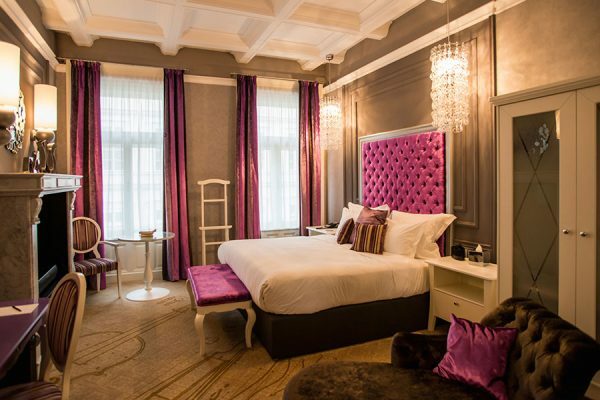 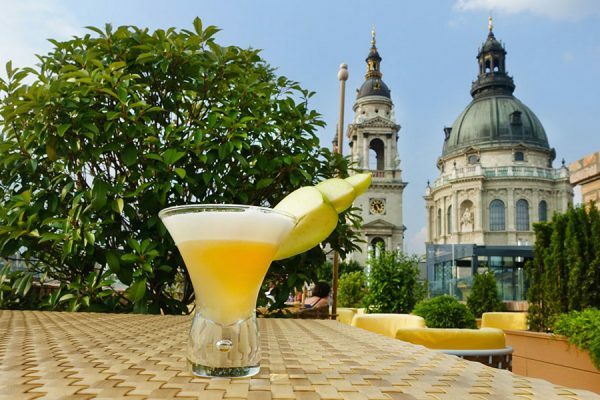 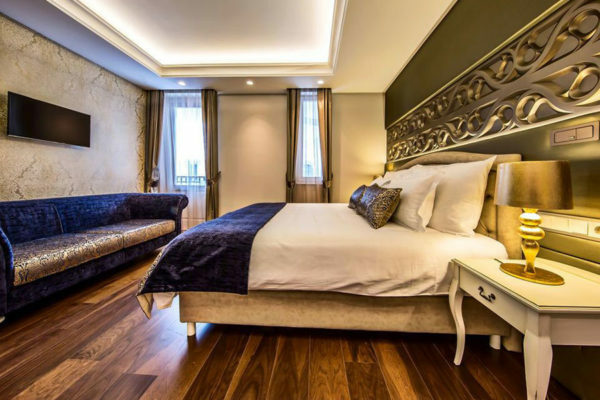 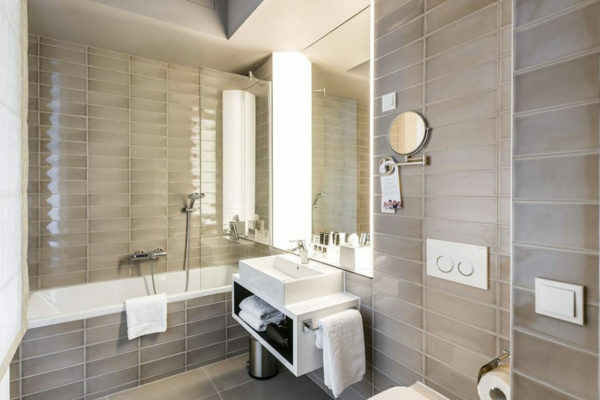 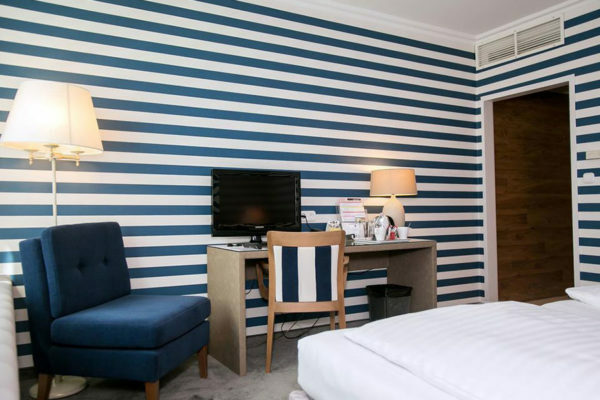 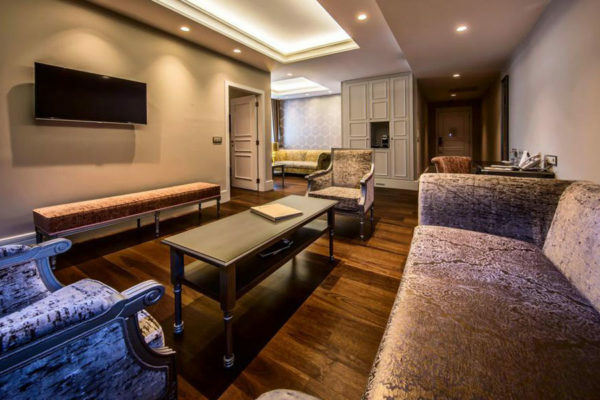 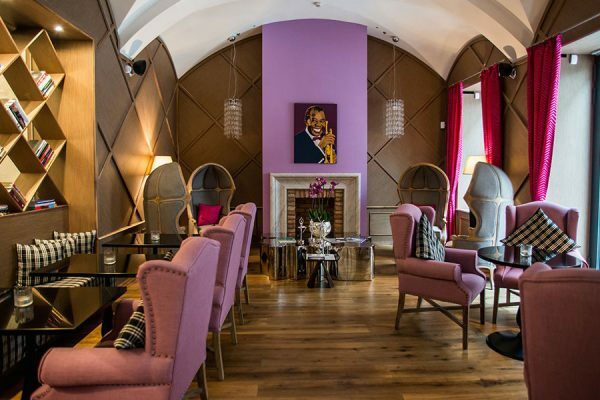 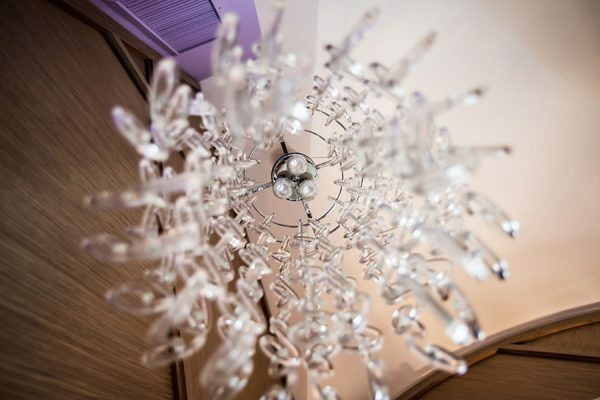 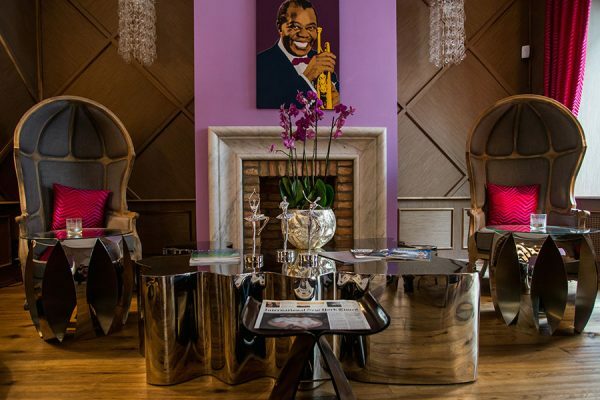 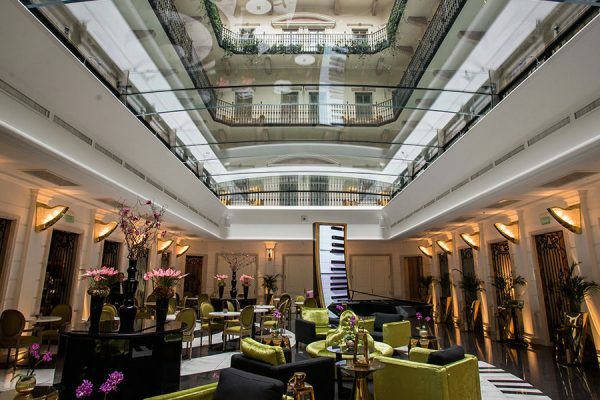 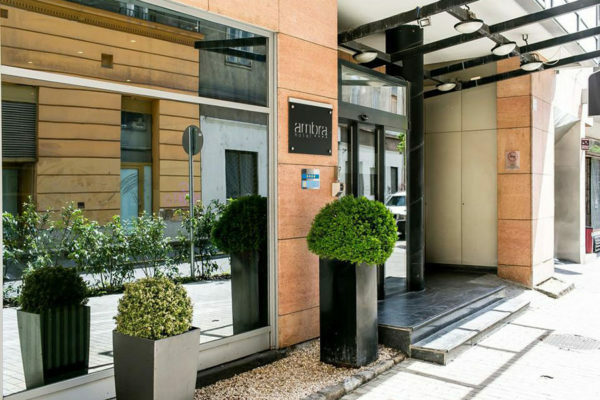 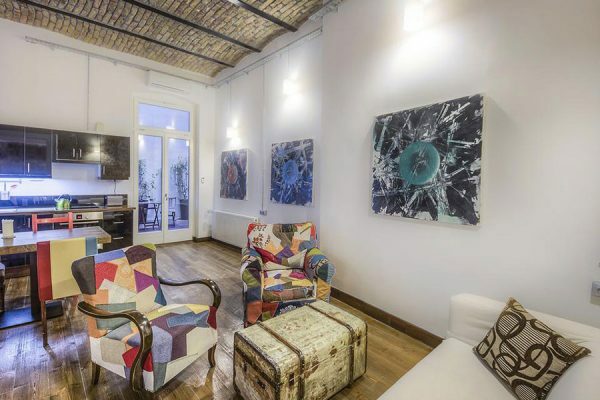 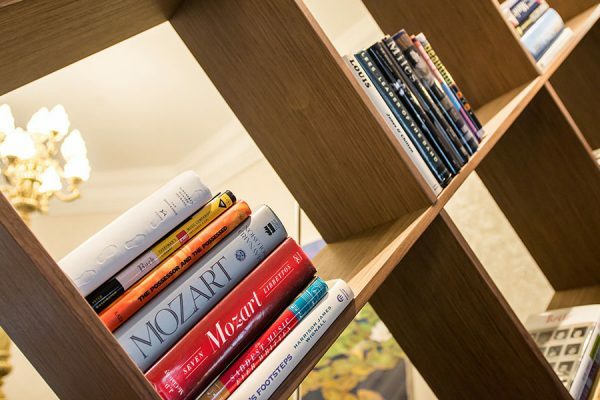 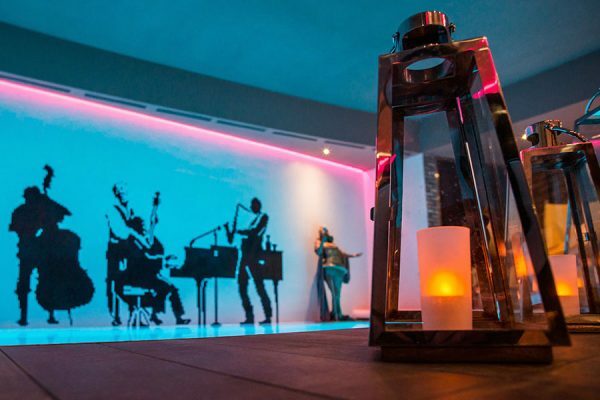 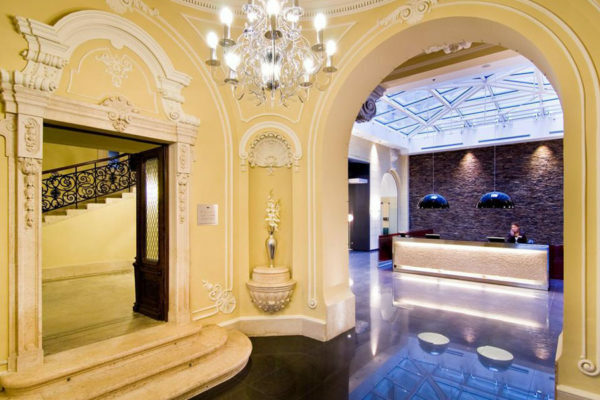 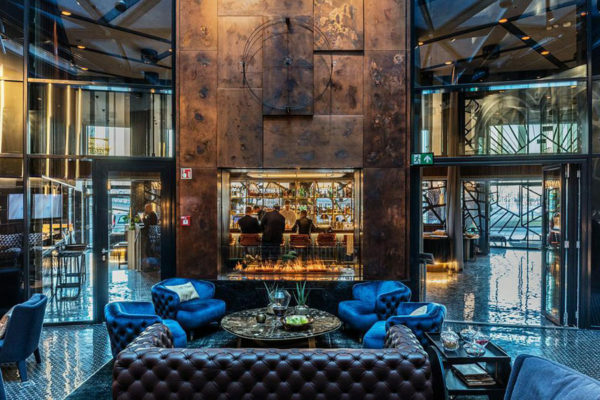 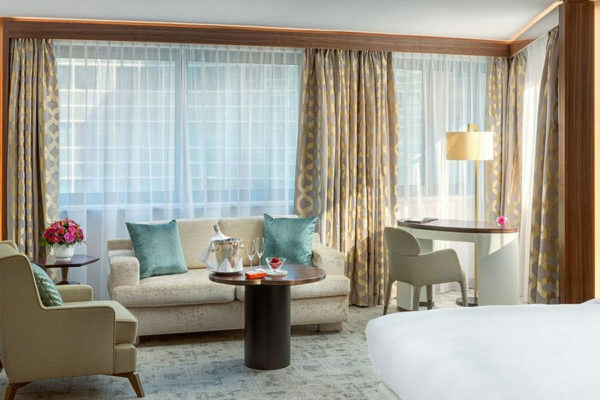 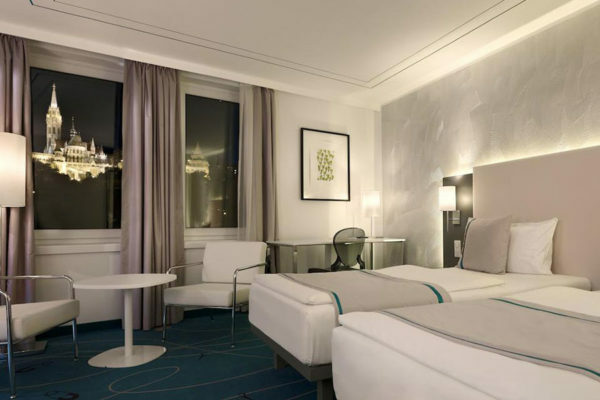 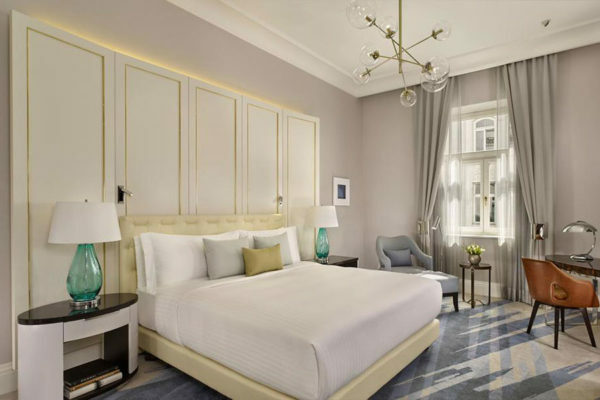 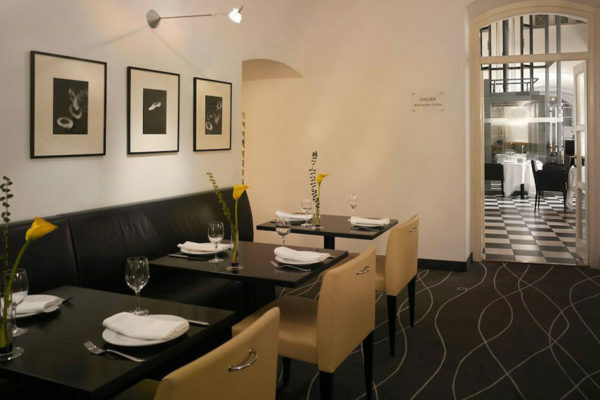 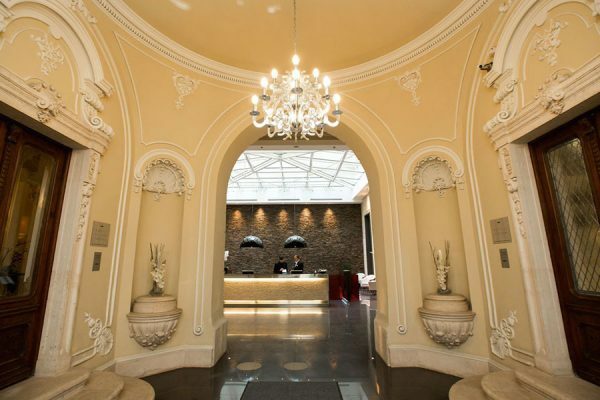 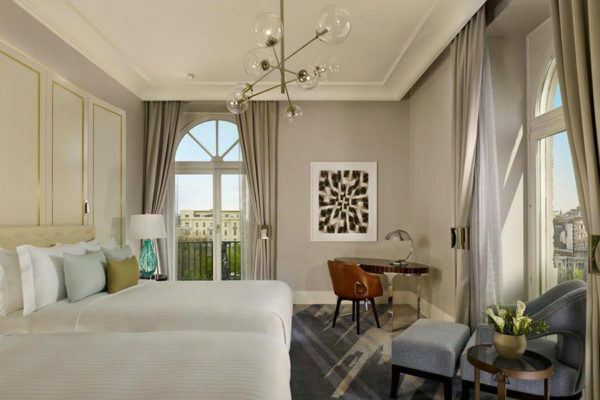 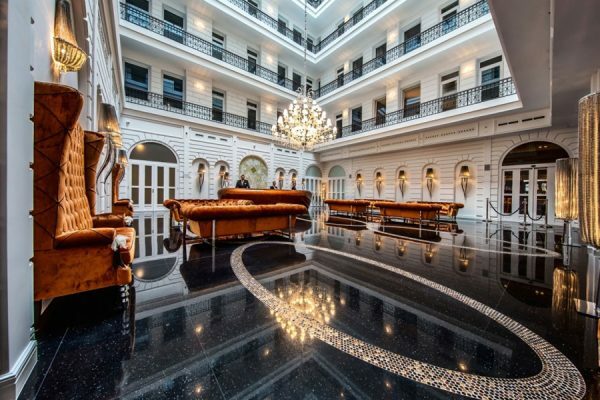 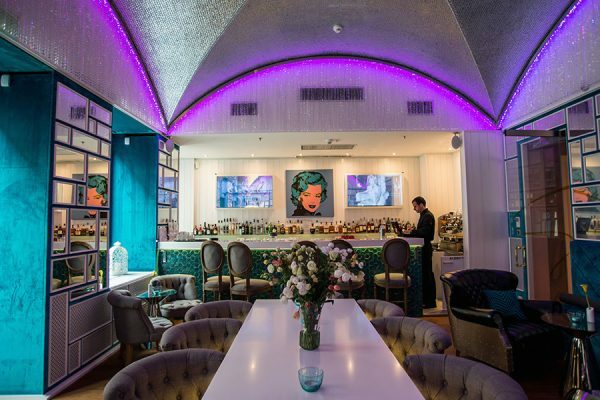 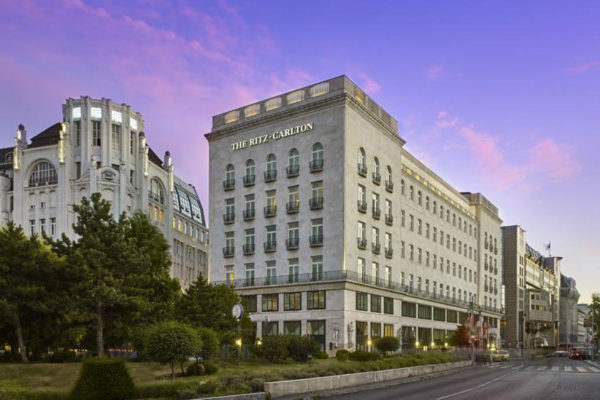 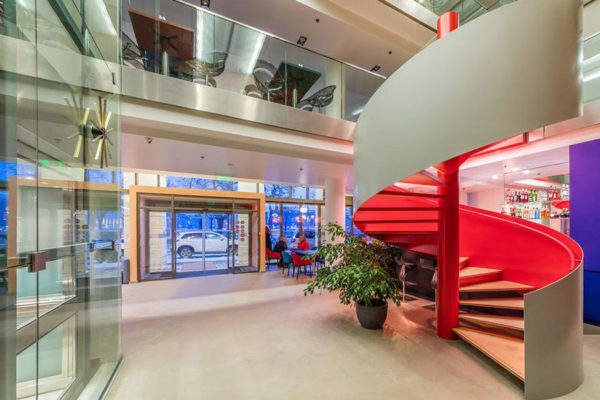 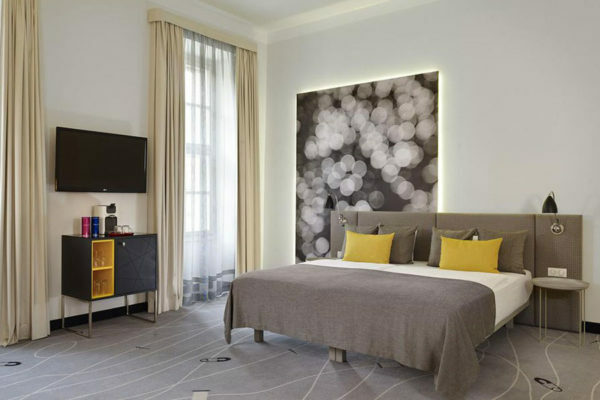 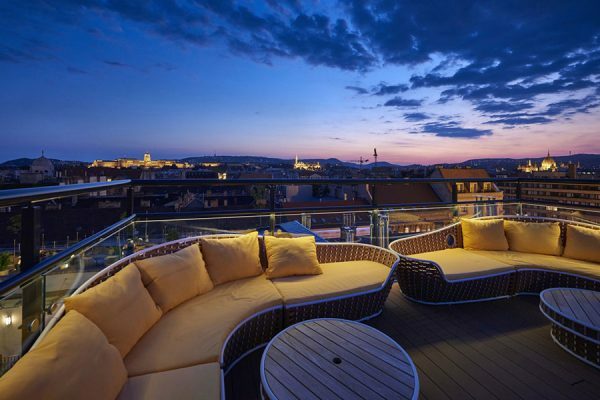 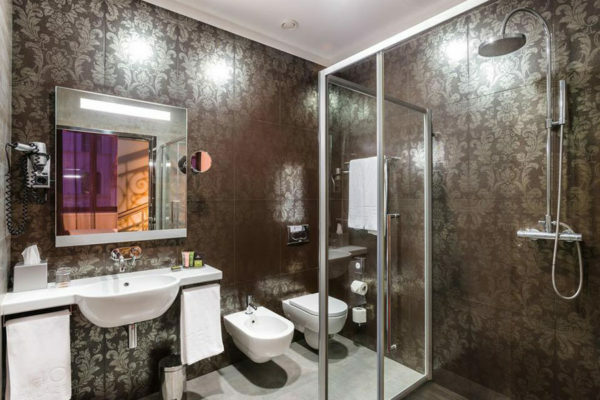 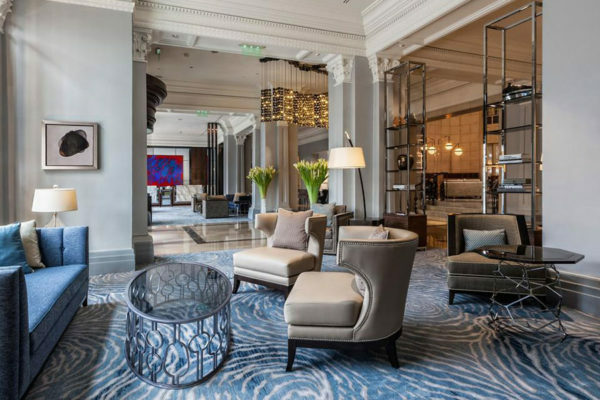 This upscale, contemporary hotel is nestled directly below the majestic Buda Castle and welcomes you with over 500 vibrant works of art from the well-known contemporary painter Donald Sultan. 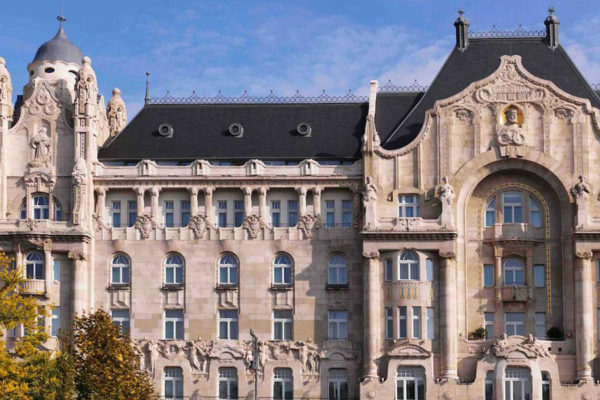 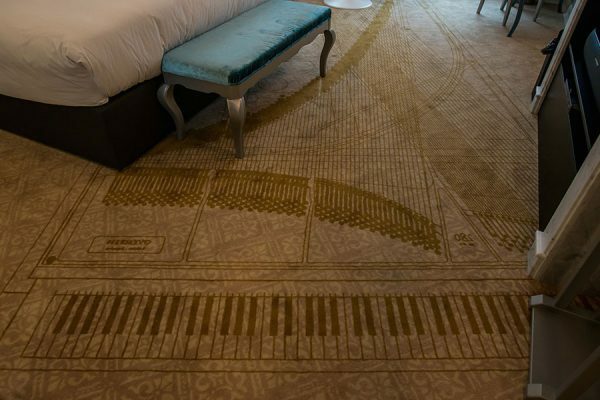 While being an American hotel chain, the stylings of Ritz-Carlton Budapest provide a more local, European feel, with blue-and-white swirled carpeting made to look like the flow of the Danube and a display case of historical Hungarian paraphernalia such as old advertising posters and a Rubik’s Cube to pull at your nostalgic heartstrings. 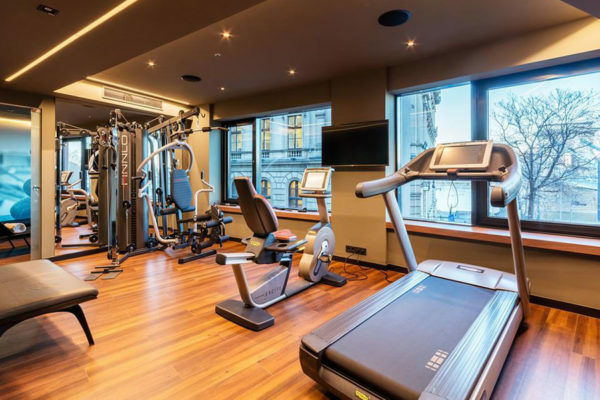 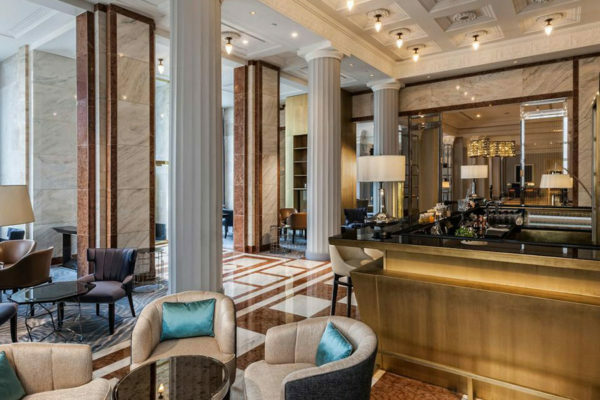 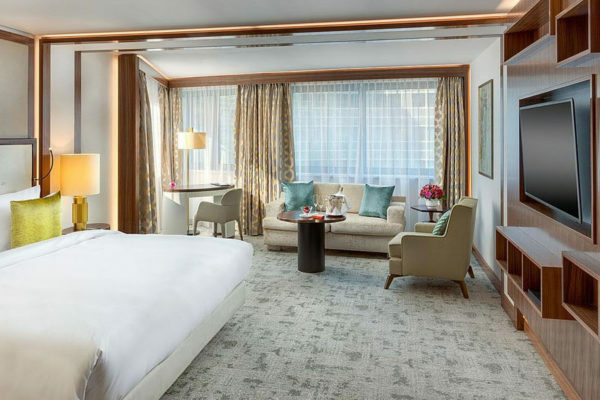 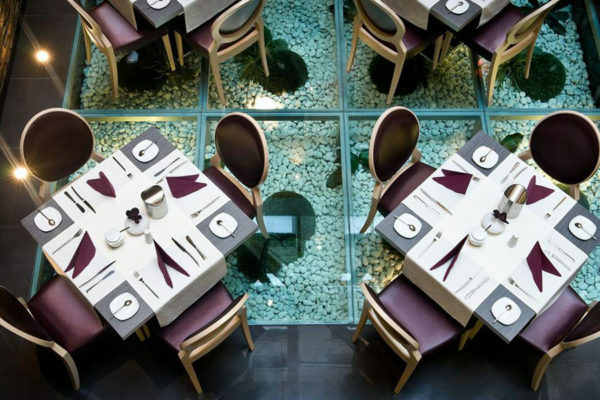 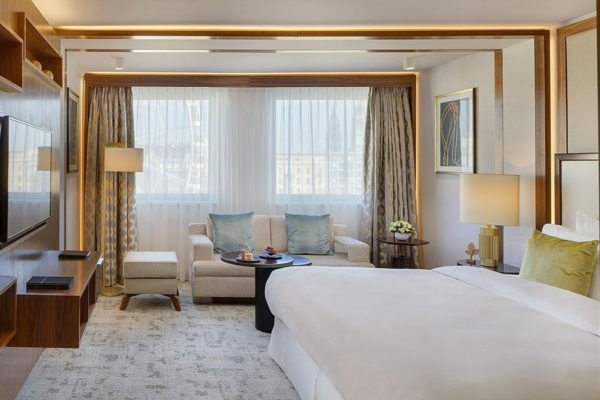 Your elegant urban escape awaits at the conveniently located Kempinski Hotel Corvinus, where you’re only a short walk from the Danube, Chain Bridge and many of the city’s most popular attractions. 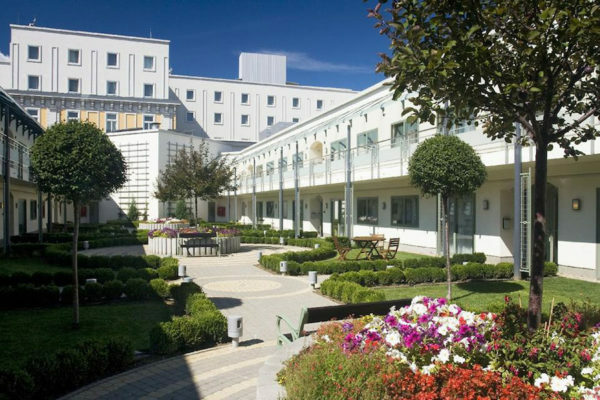 This modern building, erected in the early 90s, used to be the top accommodation for high-profile guests such as Michael Jackson. 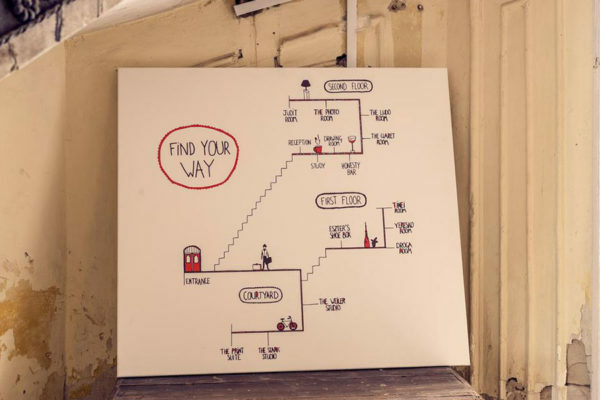 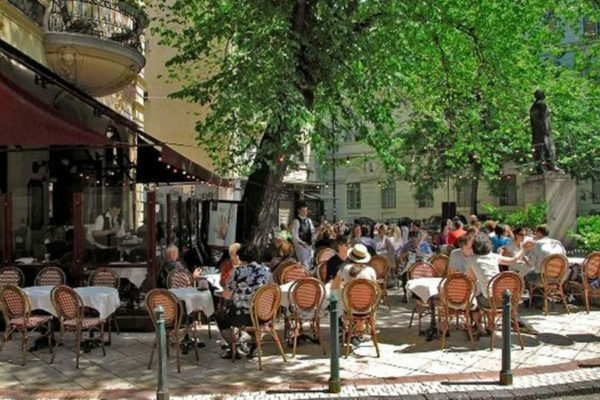 If you received a tourist map of the city don’t be surprised if the hotel’s street, Lõrinc pap tér, isn’t on there. 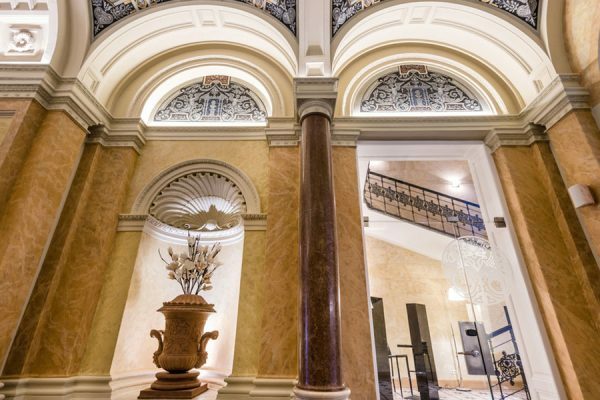 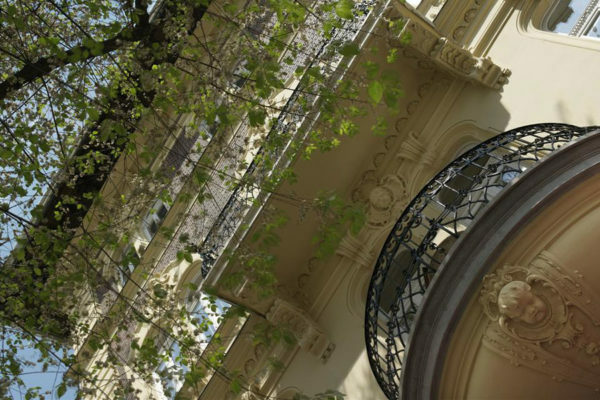 But don’t let that deter you, as Palazzo Zichy is in one of the city’s prime locations if you wish to be surrounded by stunning mansions, restaurants, attractions, sites and cafés. 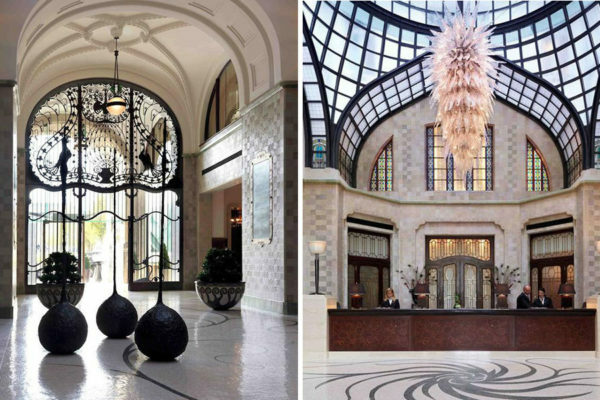 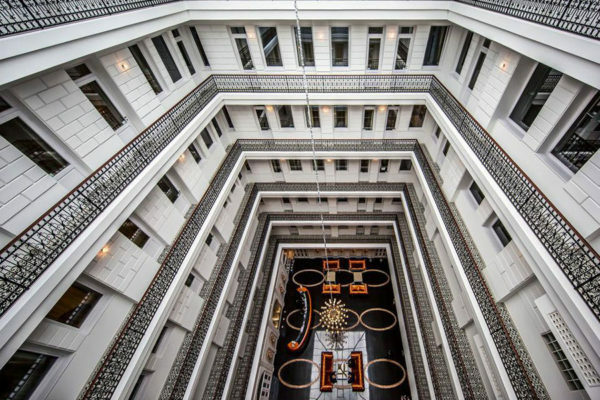 This is the hotel that inspired Wes Anderson’s movie! 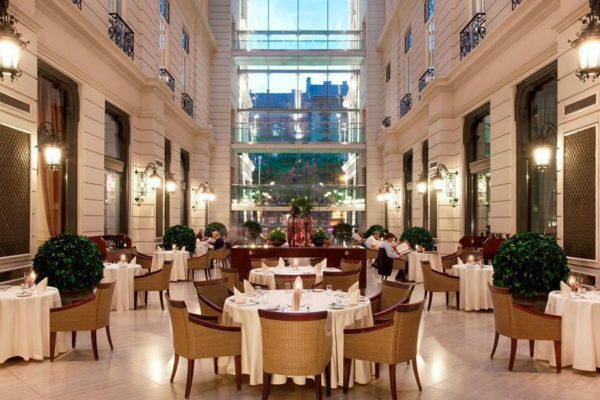 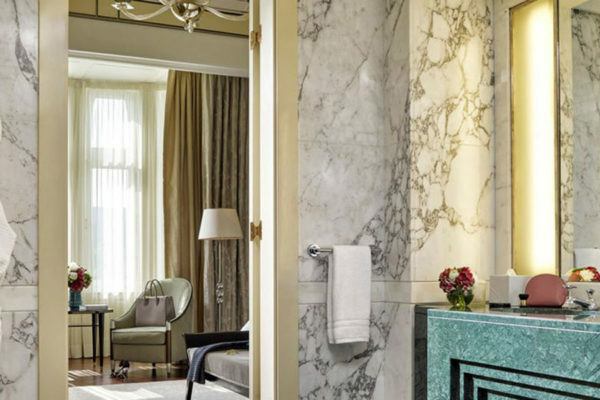 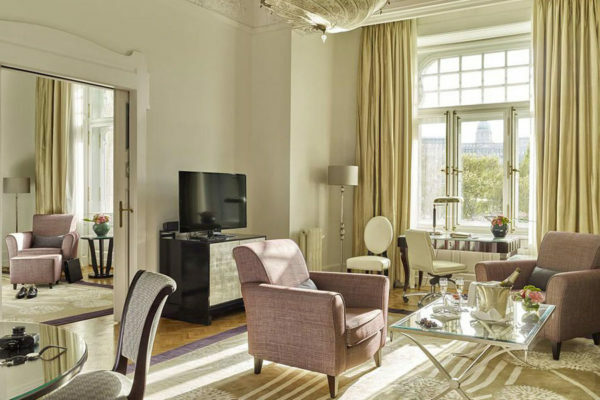 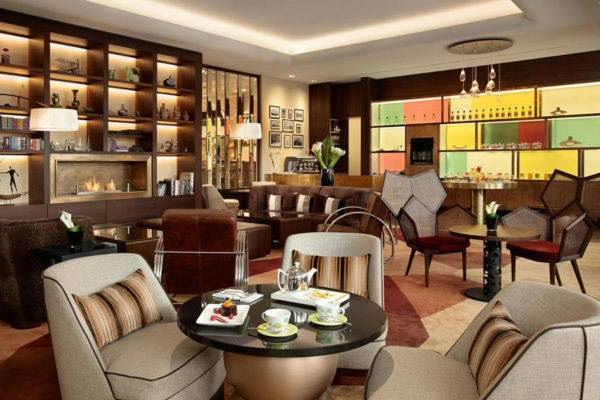 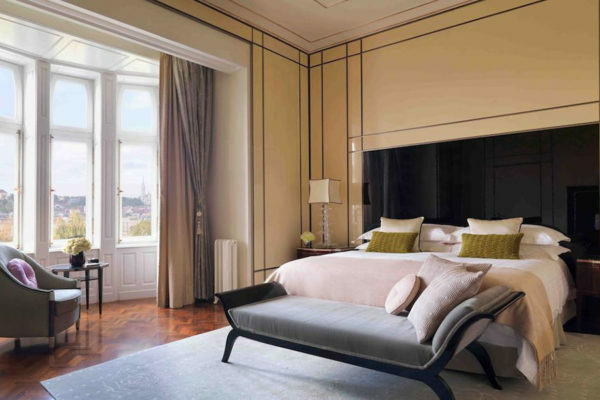 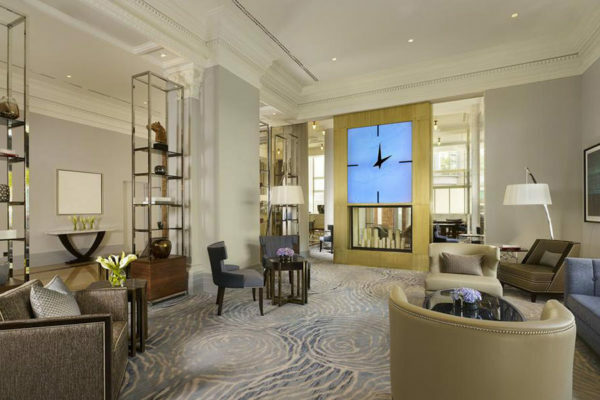 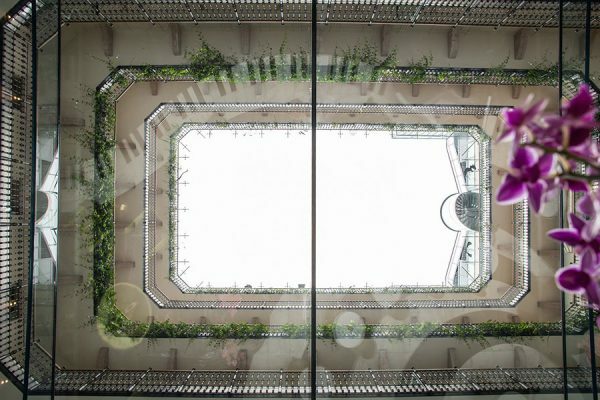 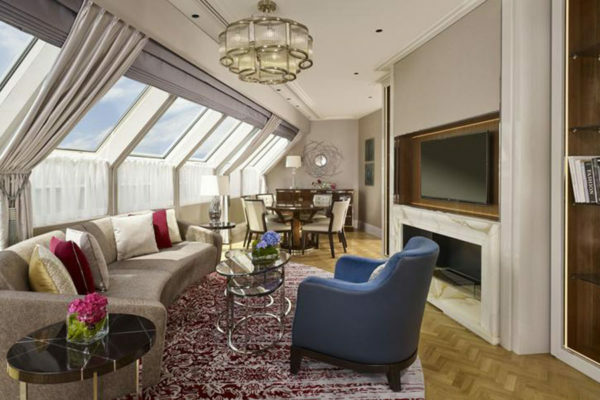 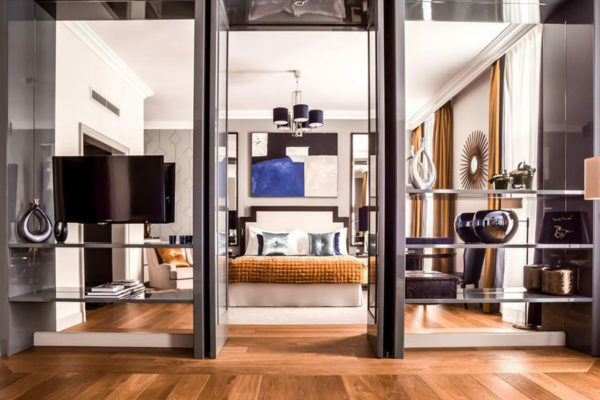 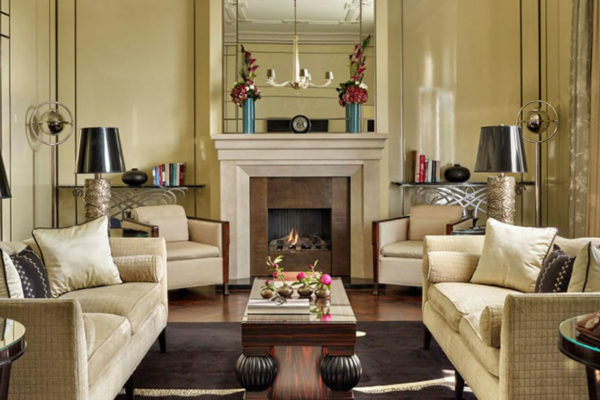 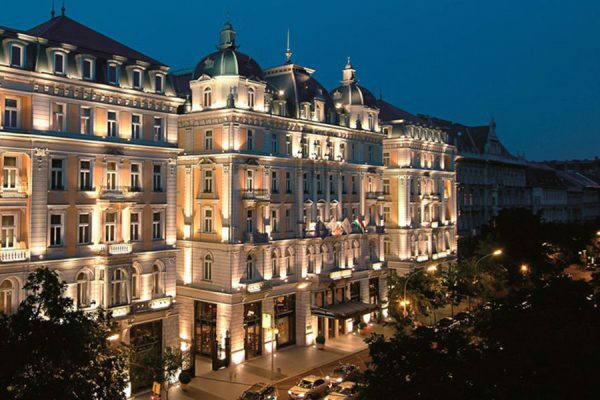 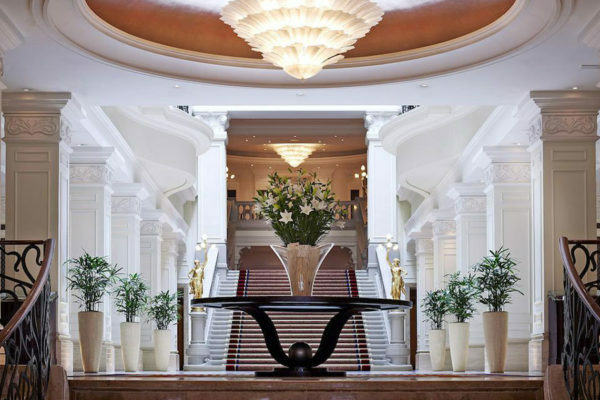 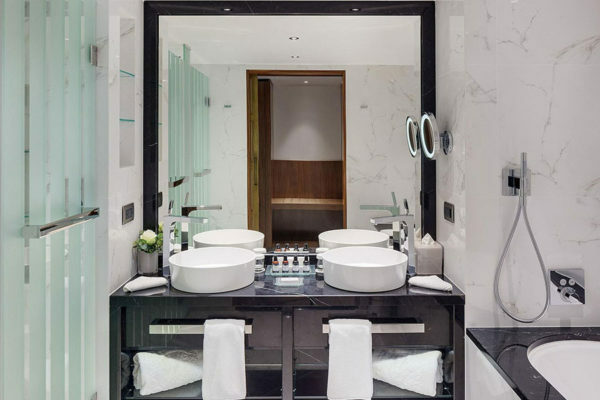 If you loved Wes Anderson’s film “The Grand Budapest Hotel” then you have to stay in the hotel that inspired it all, the Corinthia Hotel Budapest. 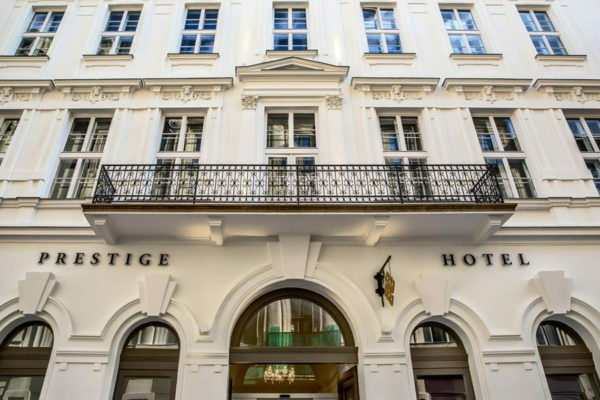 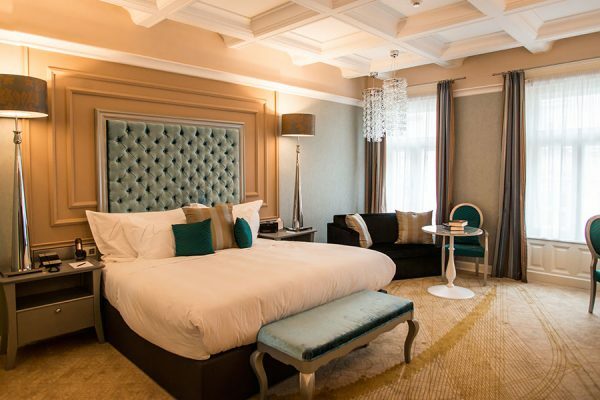 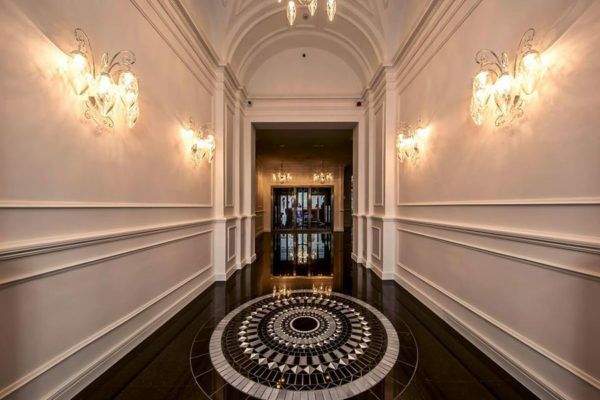 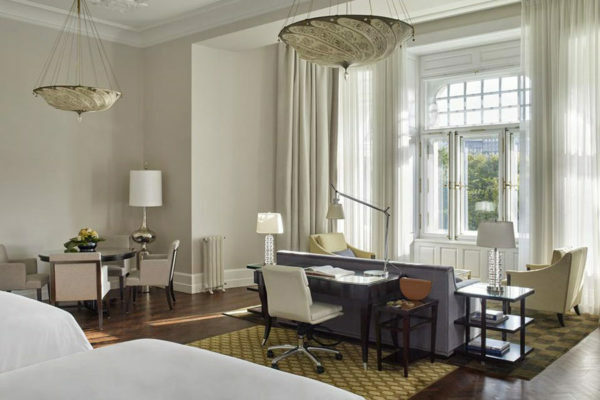 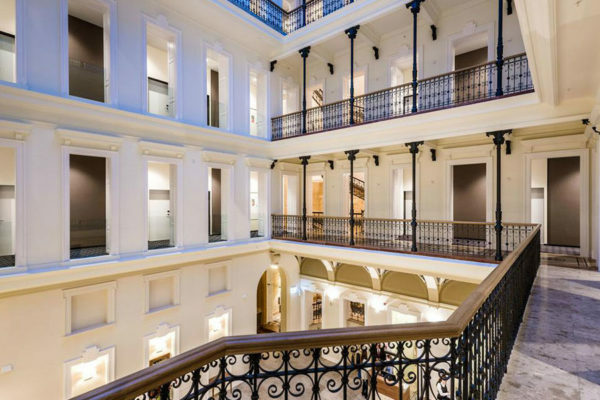 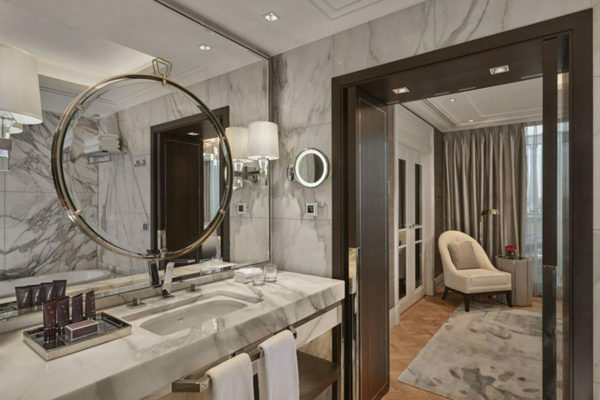 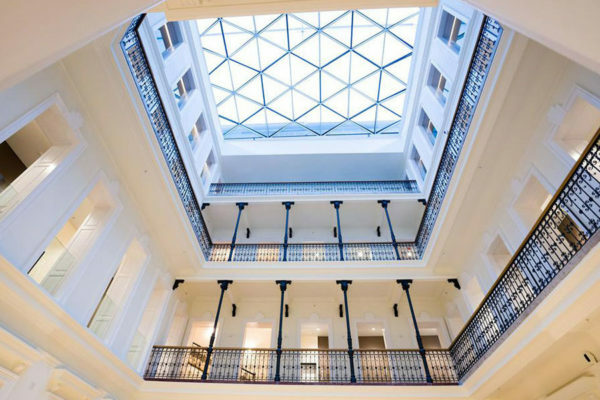 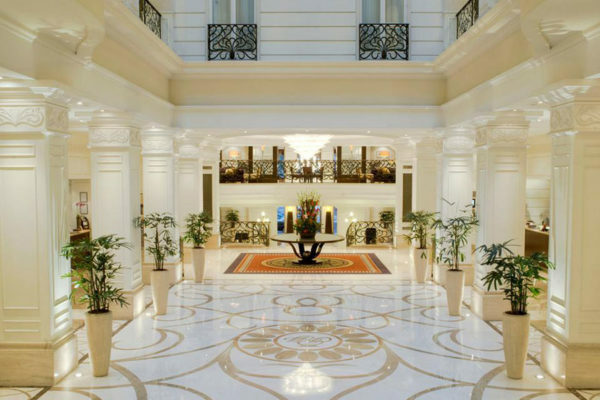 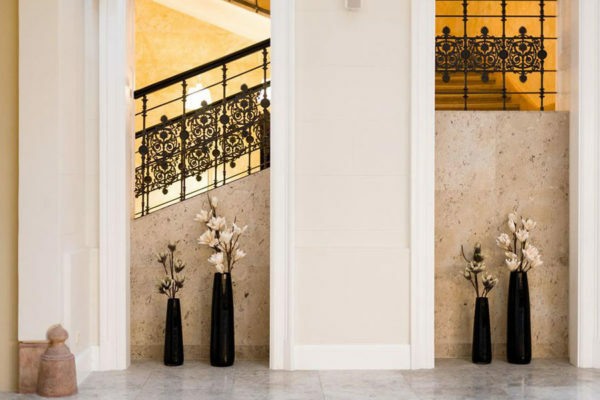 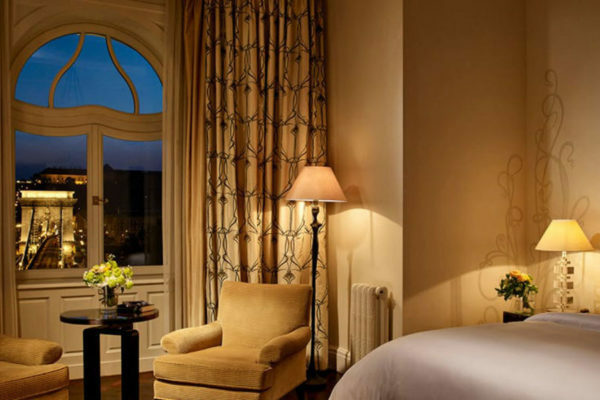 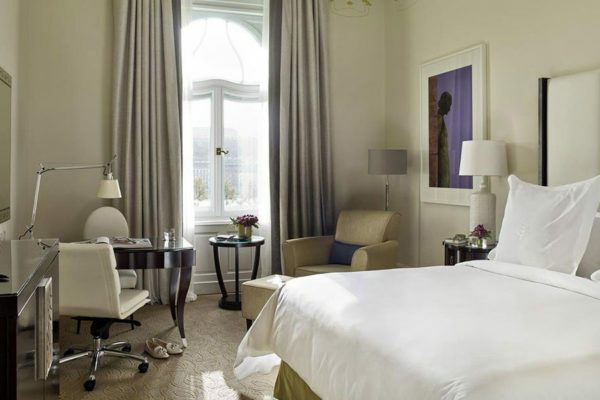 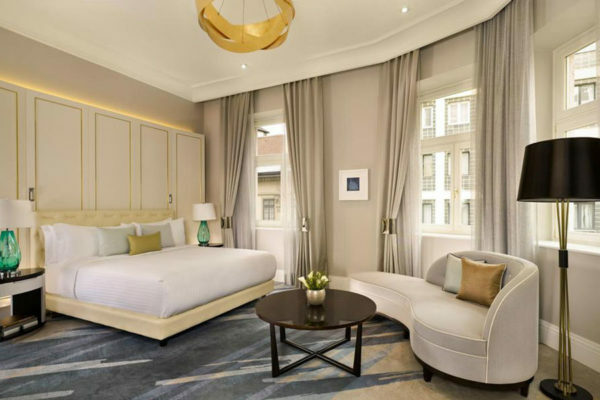 One look at the creamy neoclassical exterior and you’ll quickly see why this hotel is one of the most beautiful accommodations in the city. 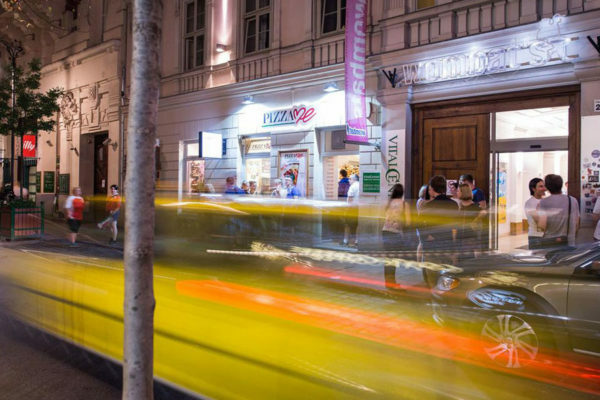 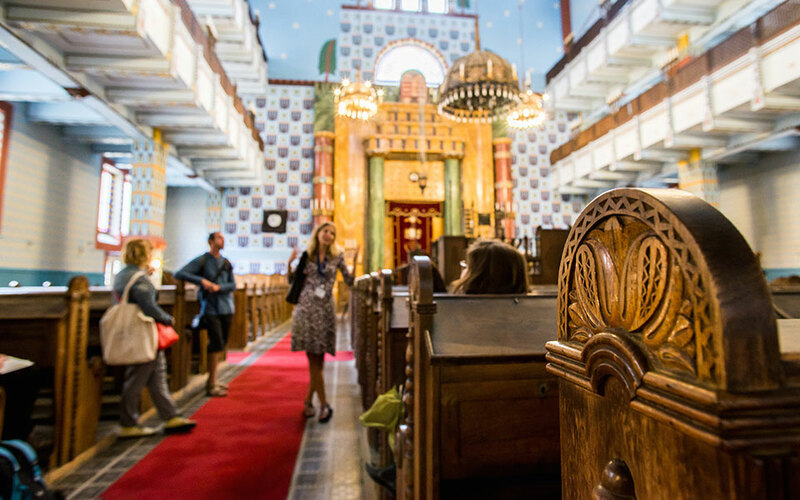 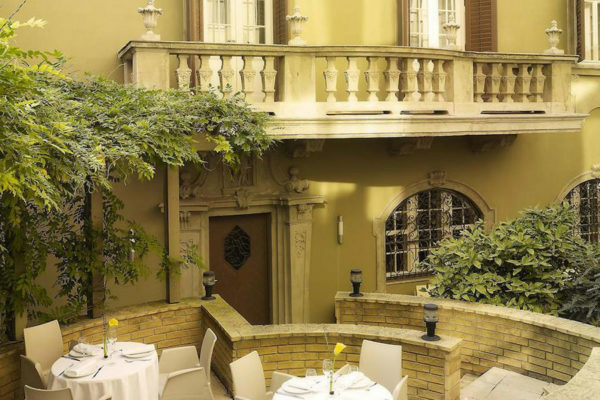 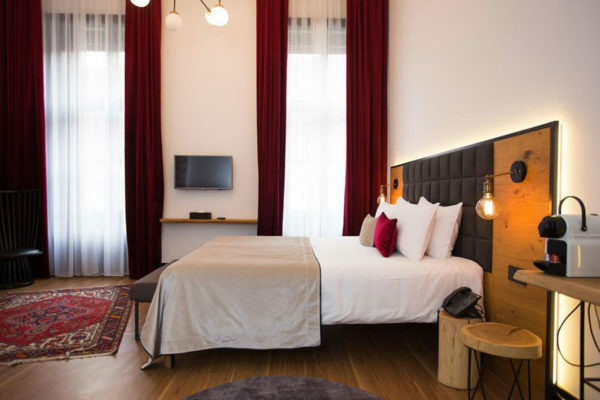 Only minutes from the esteemed Opera House, the Ambra Hotel is right in the hustle and bustle of Budapest’s Jewish Quarter (7th district) but remains on a quieter street so you can get a little shuteye. 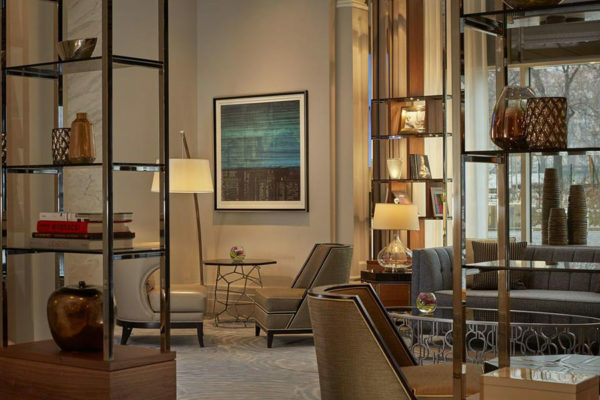 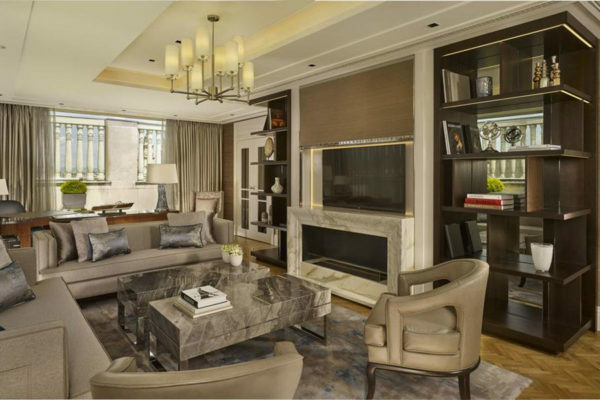 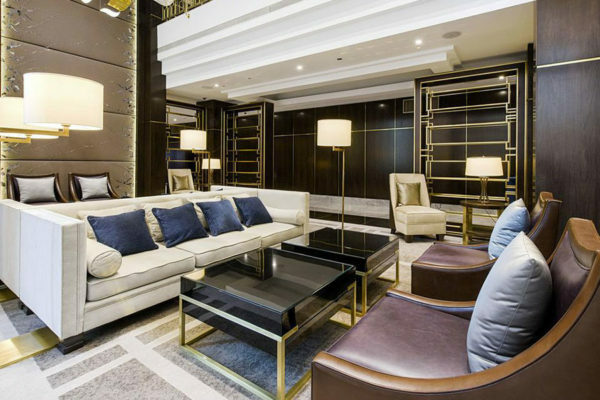 The contemporary, spacious lobby beckons you to grab a book from the bookshelves and unwind on one of the plush, velvet-like couches. 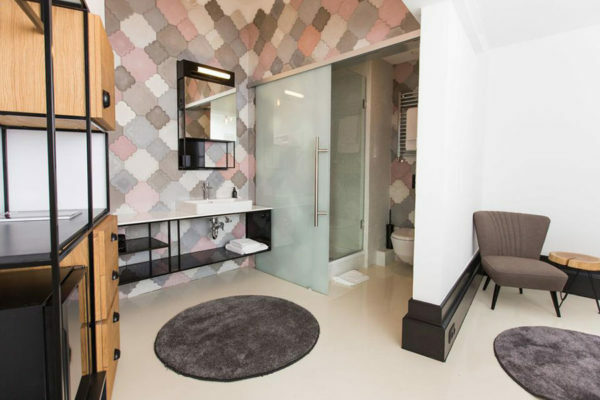 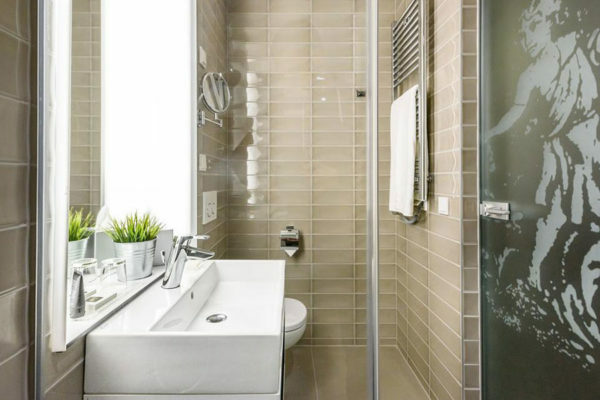 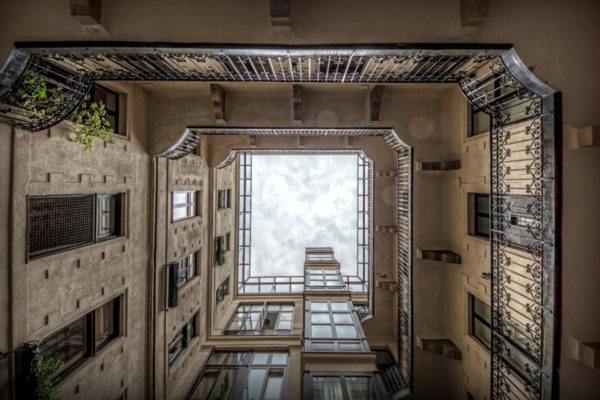 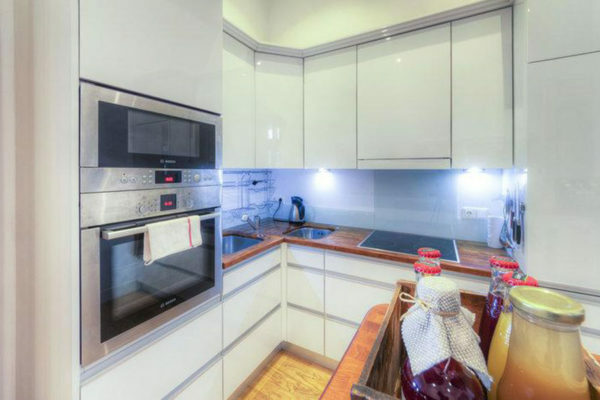 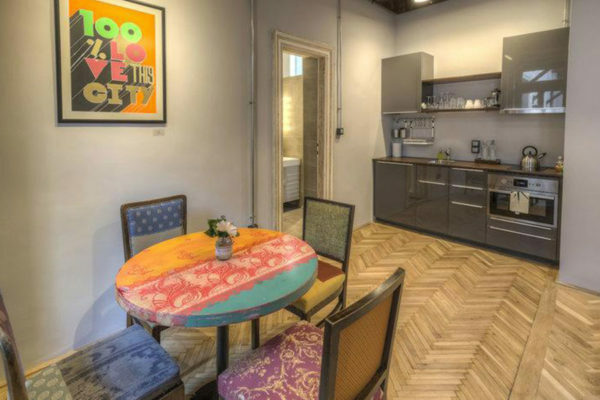 BrodyLand is at it again with another blockbuster accommodation known as Paulay House, which provides clean-lined and rustic apartments located right in the center of the city. 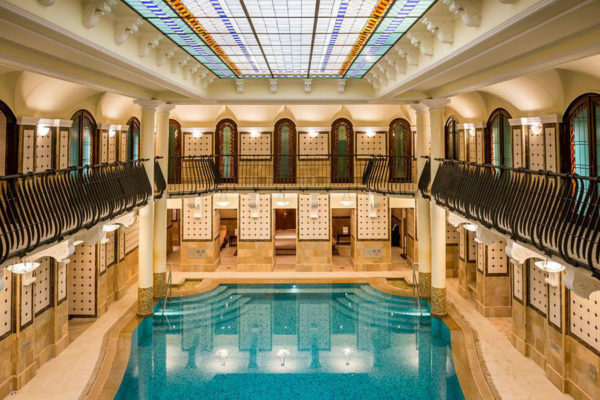 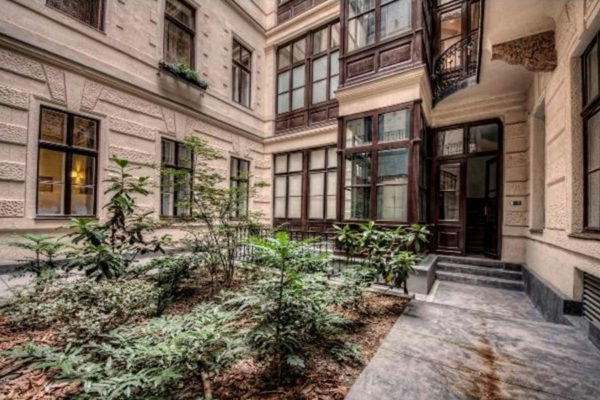 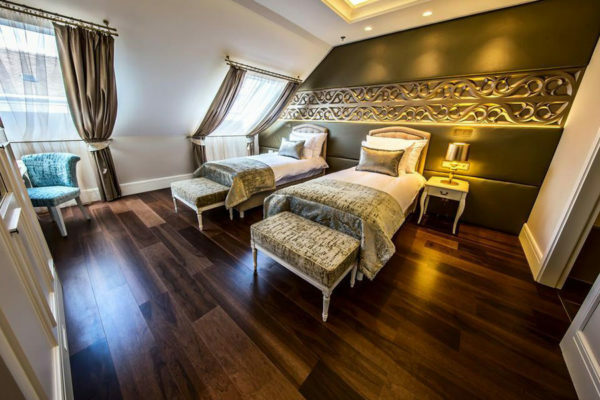 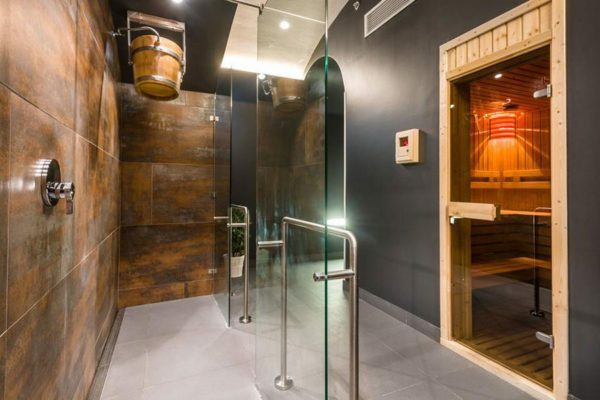 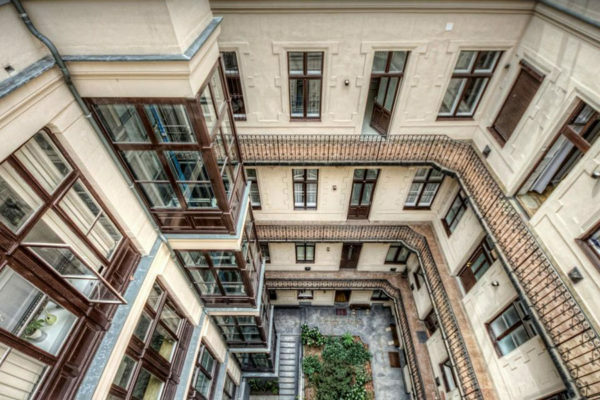 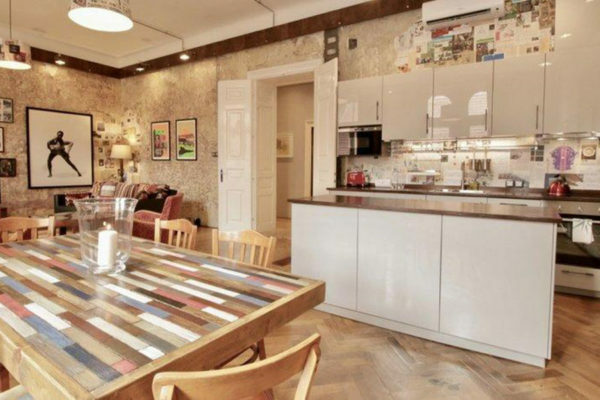 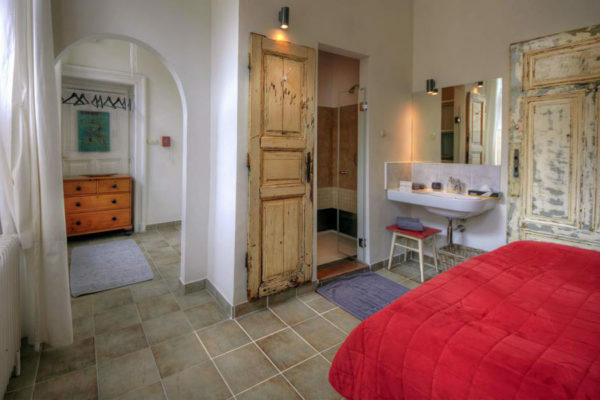 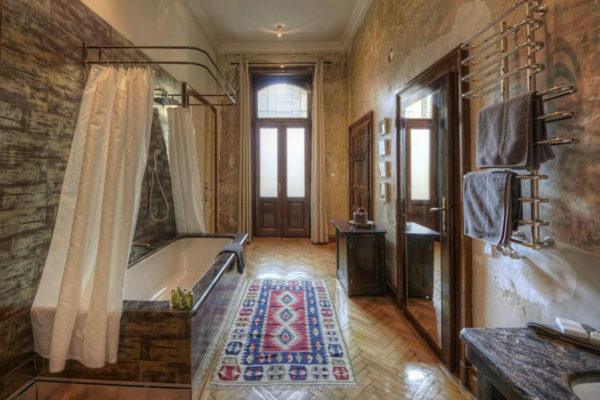 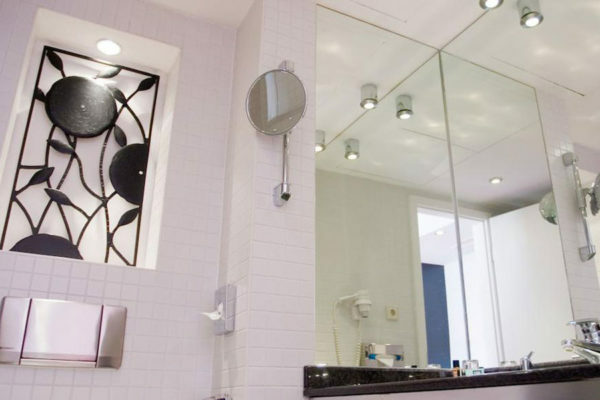 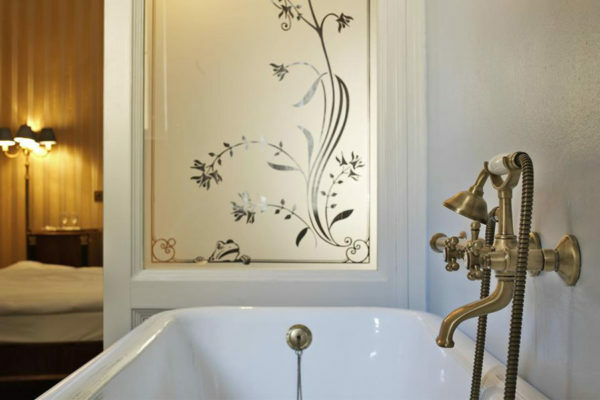 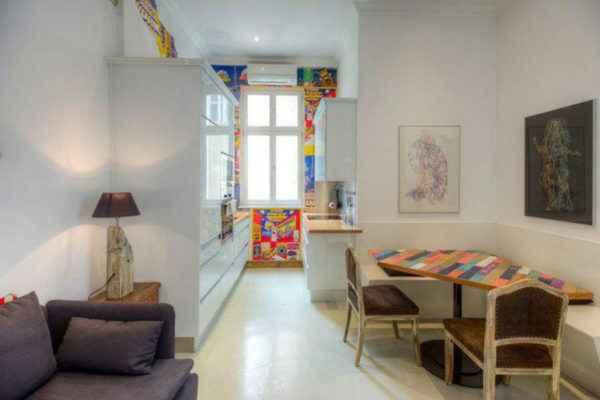 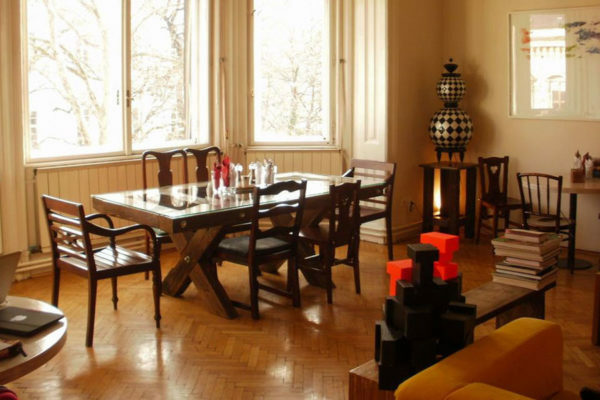 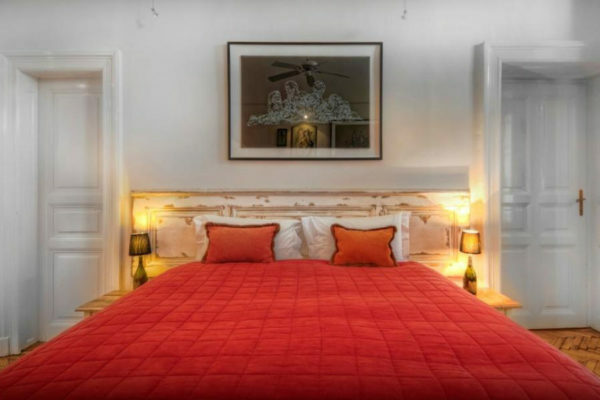 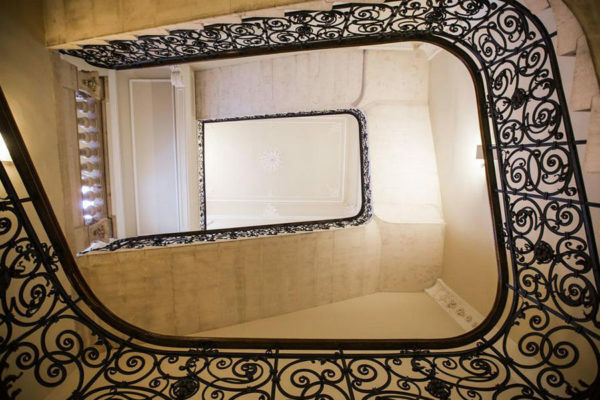 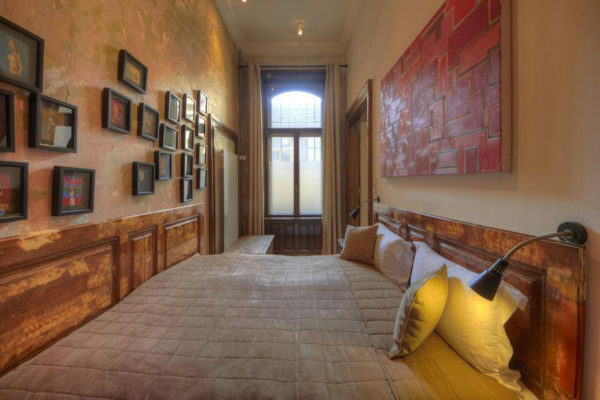 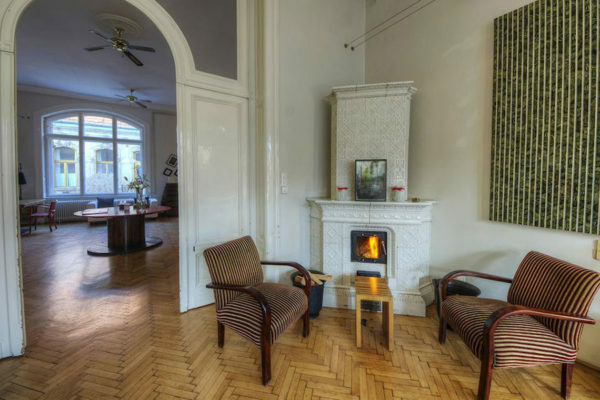 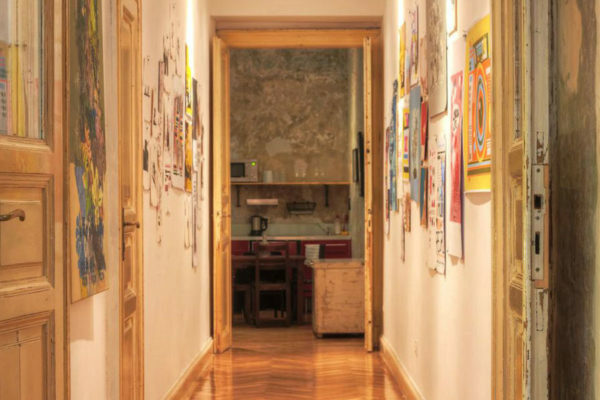 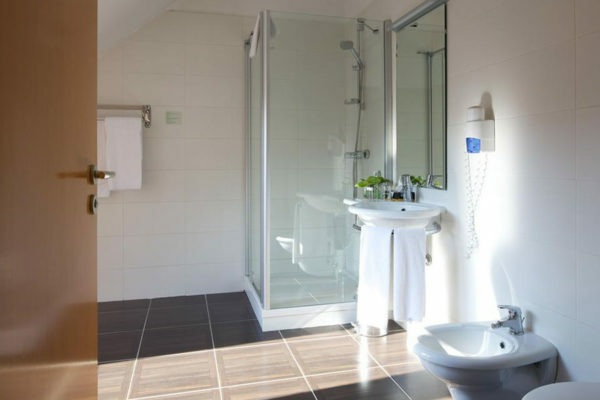 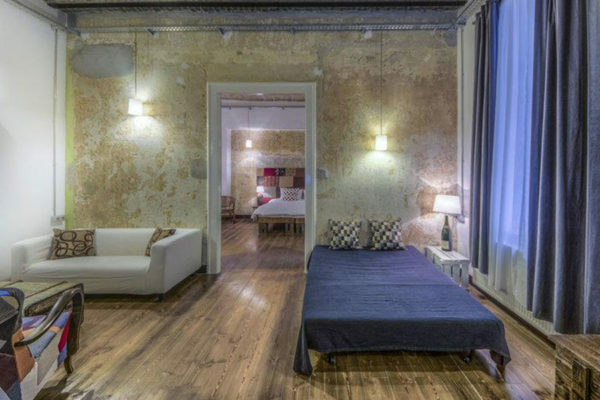 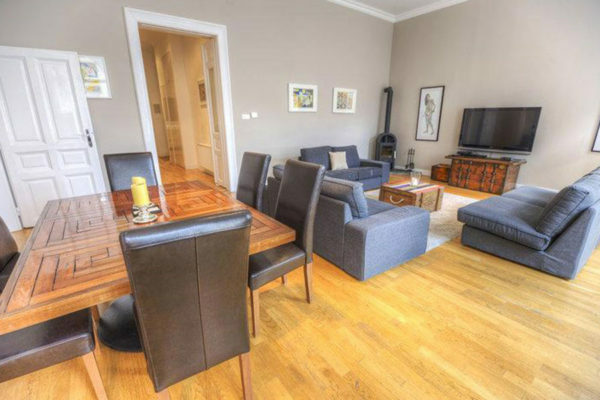 No matter if you are just visiting Budapest for a night or you’ll be calling Budapest home for several months, Paulay House is perfect for both short- and long-term stays. 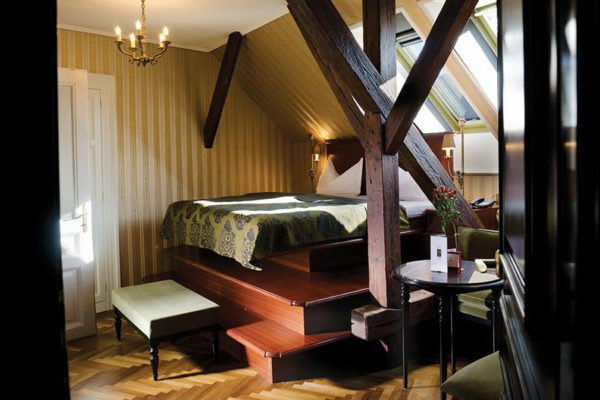 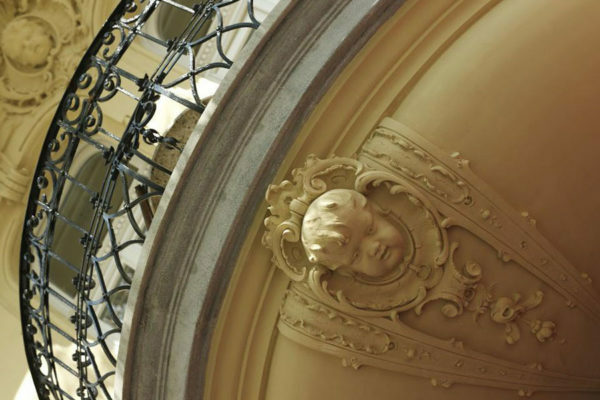 Directly above the famous Parisian-style Gerlóczy Café and up the iron-laden spiral staircase is a romantic getaway in the heart of Budapest. 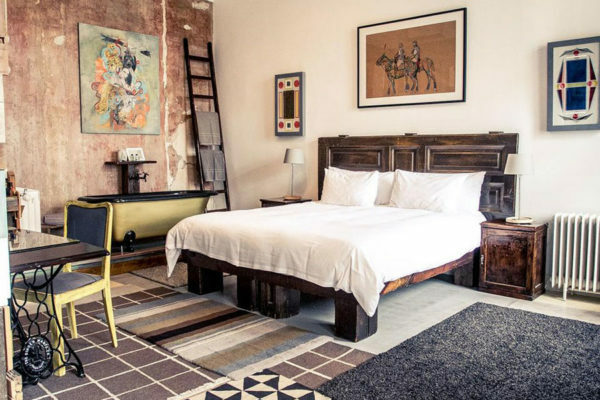 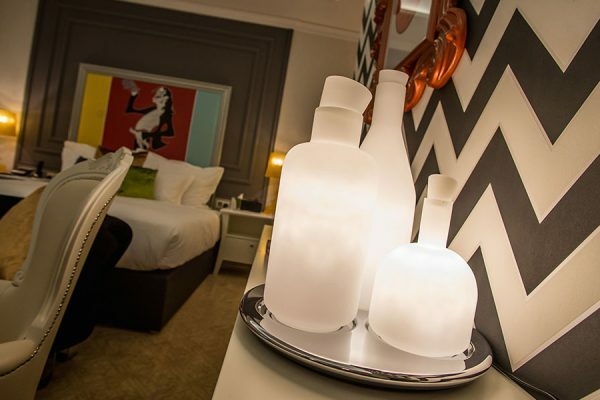 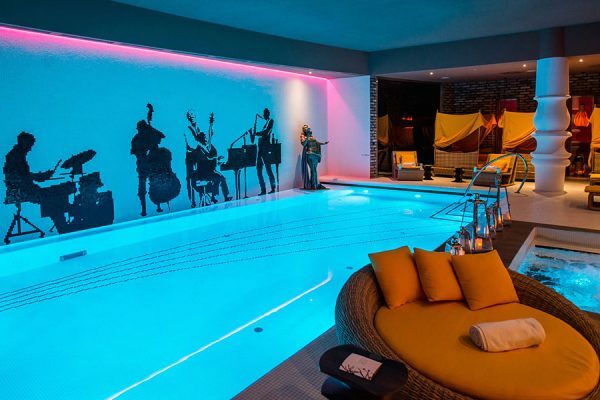 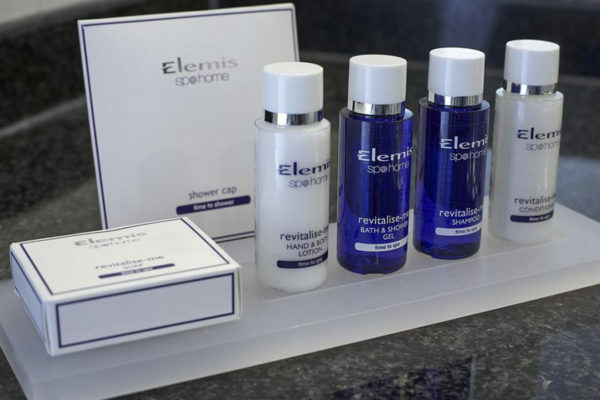 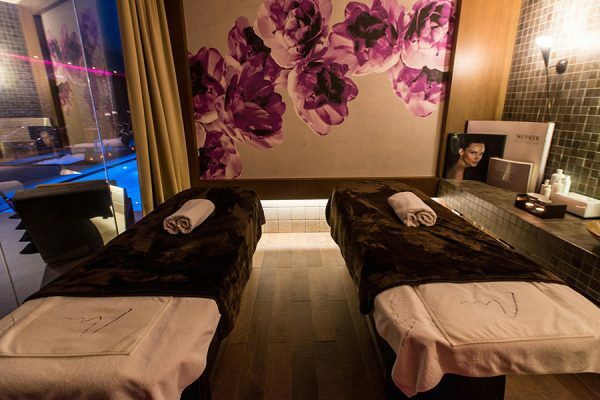 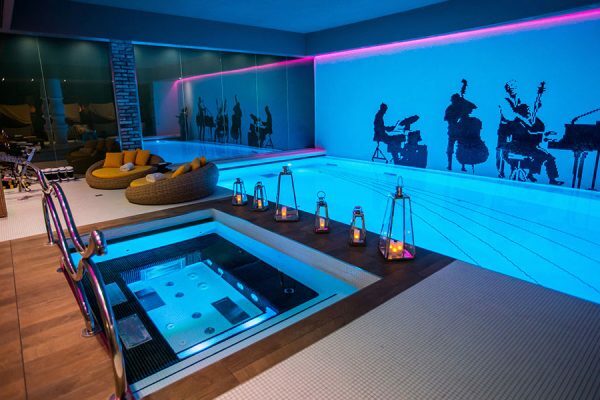 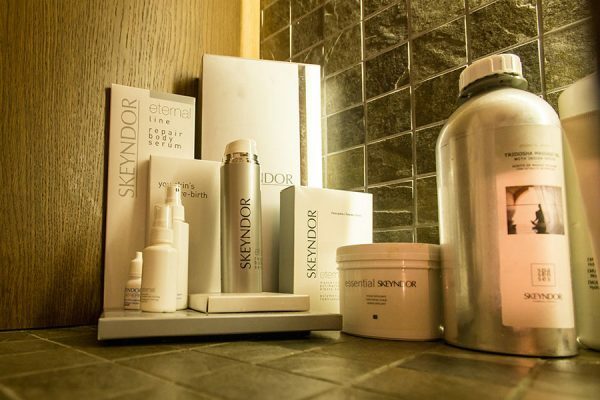 This is not your traditional hotel but rather a sneak peek into a more local experience. 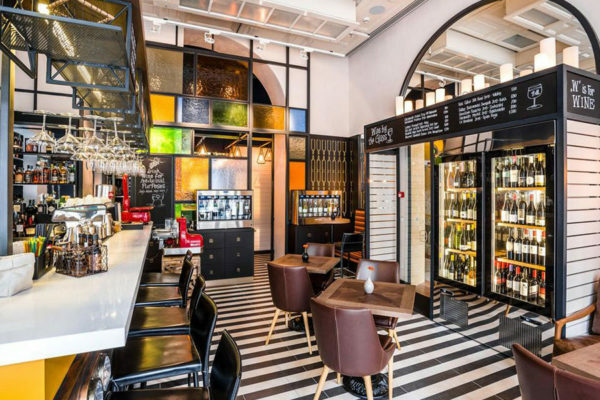 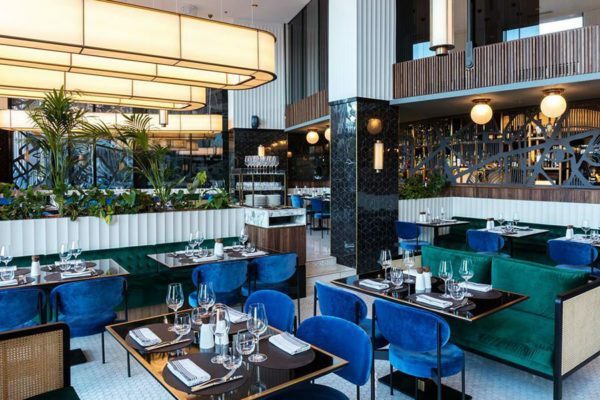 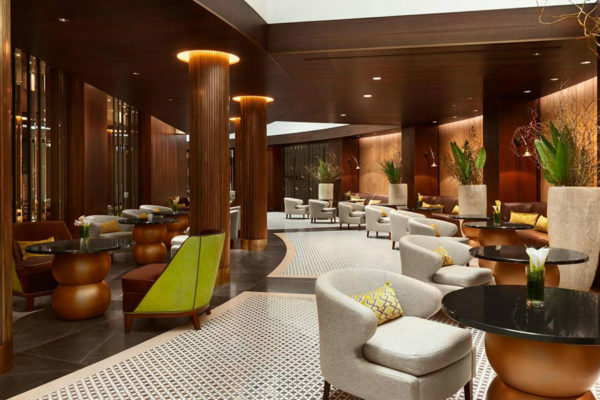 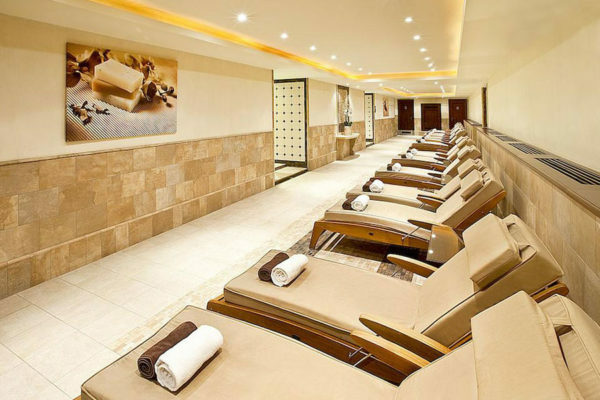 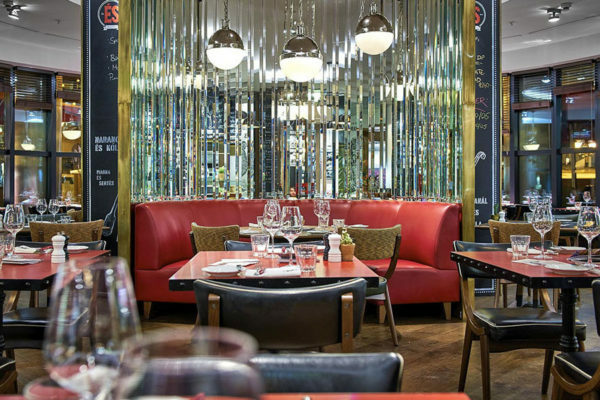 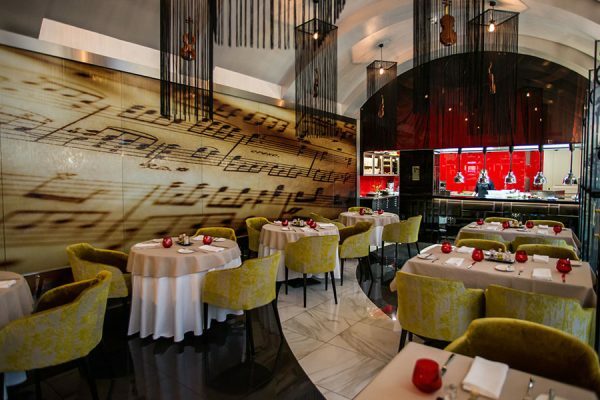 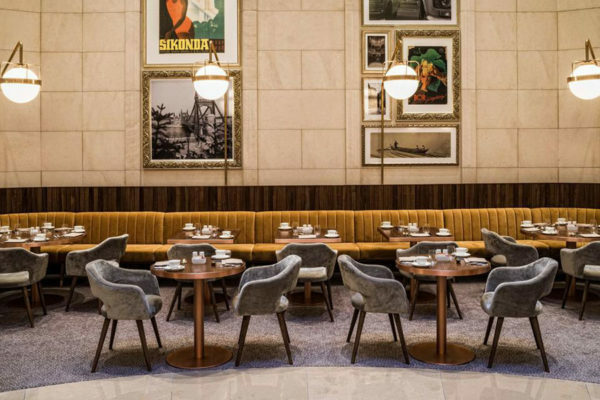 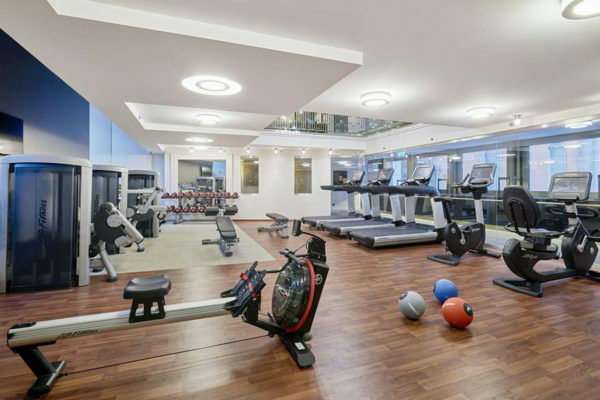 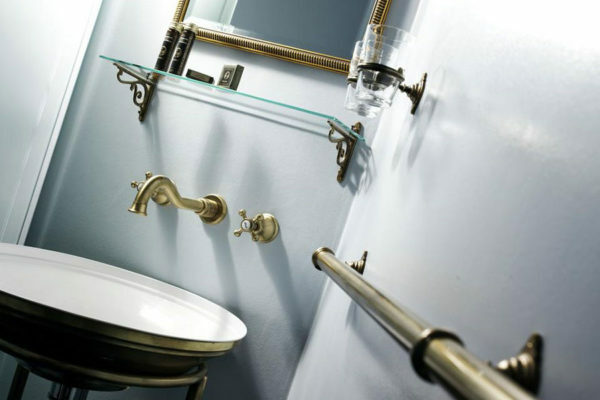 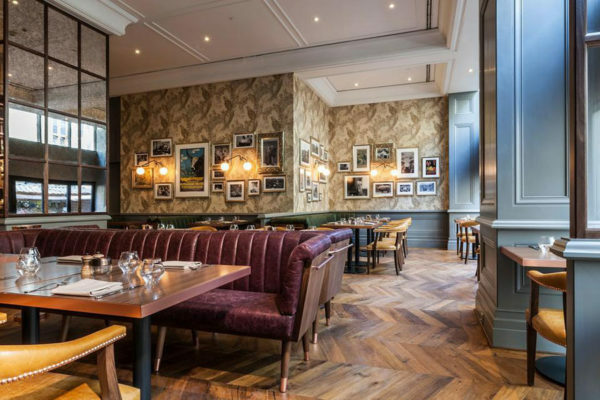 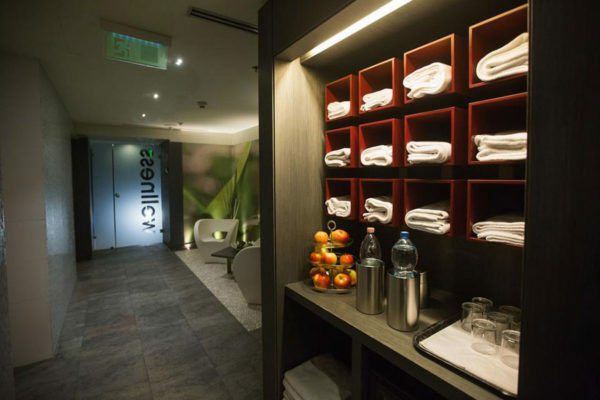 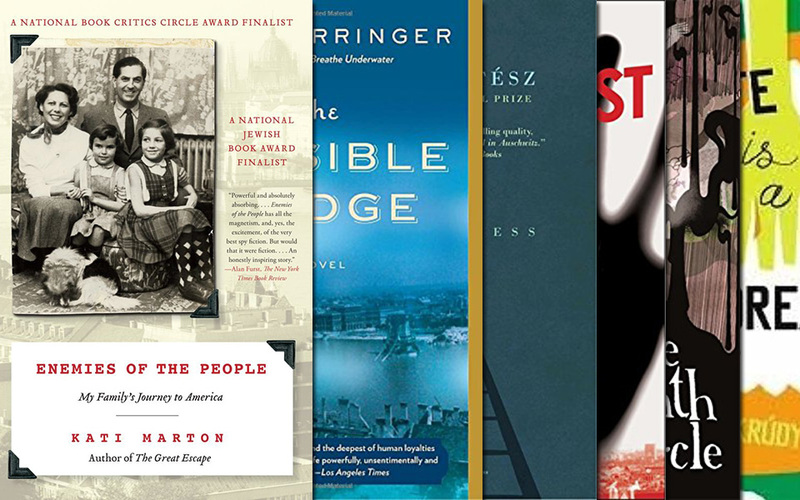 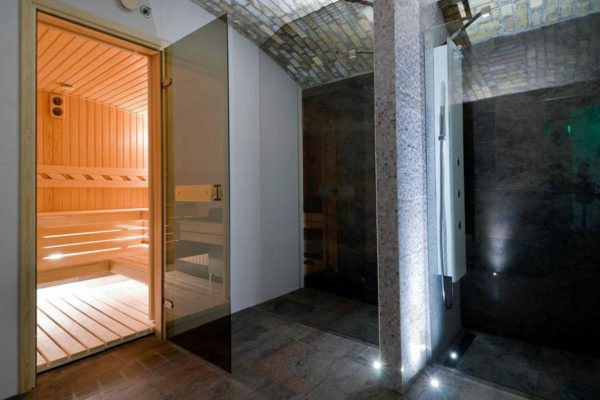 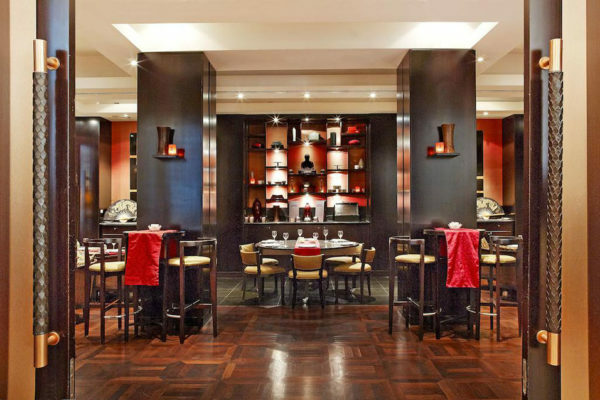 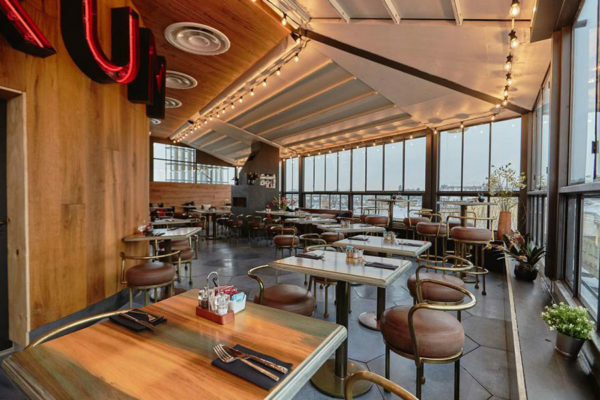 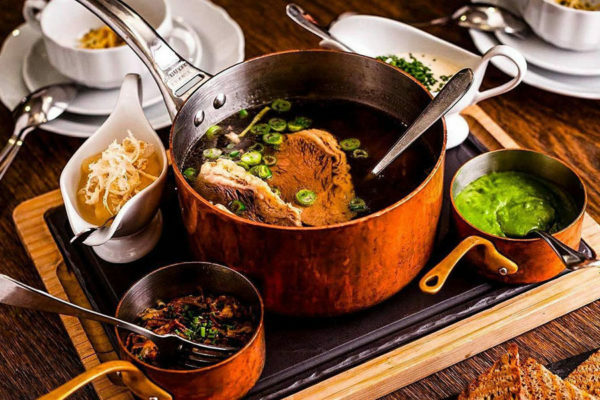 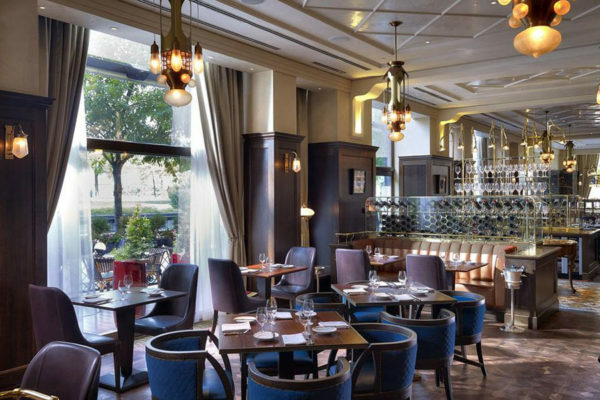 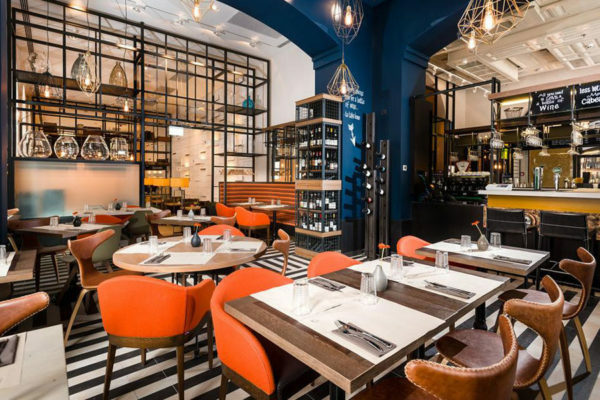 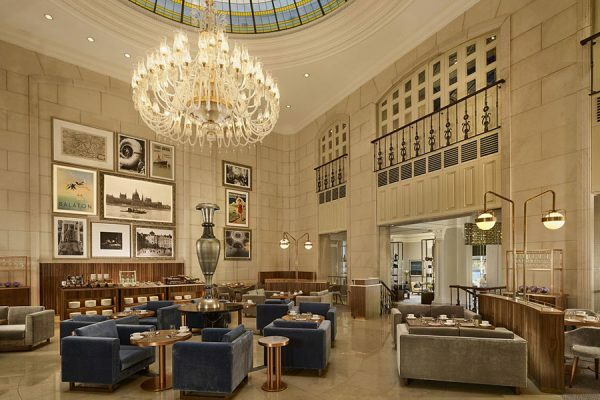 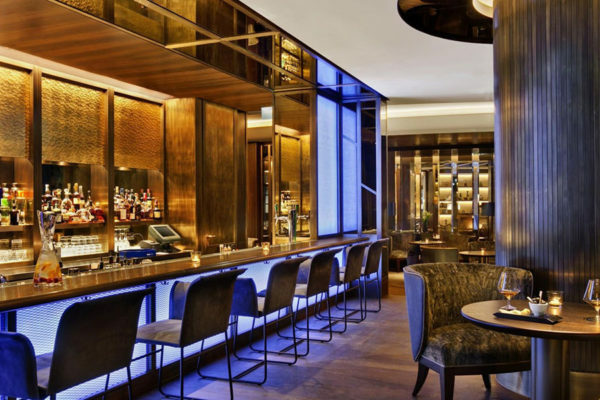 Gerlóczy pays homage to its Old World architectural bones while providing upgraded, modern-day amenities and features. 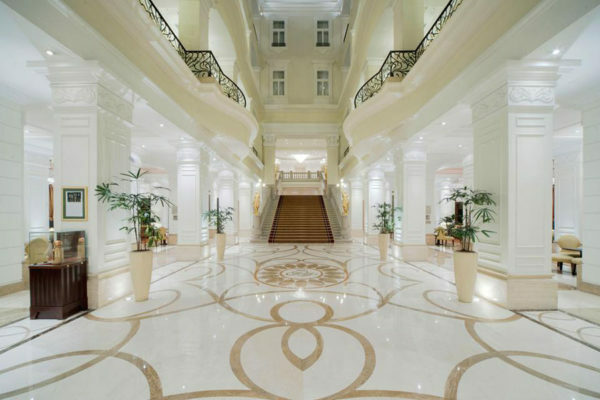 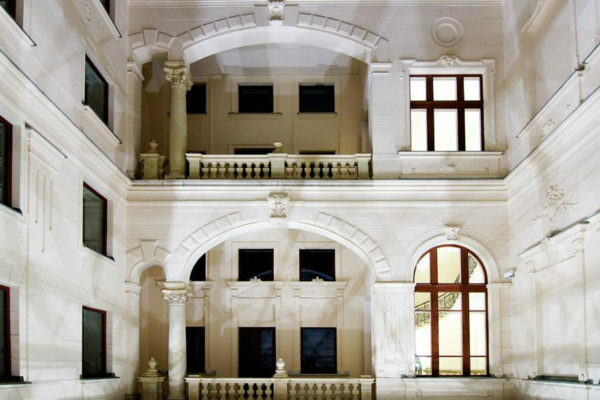 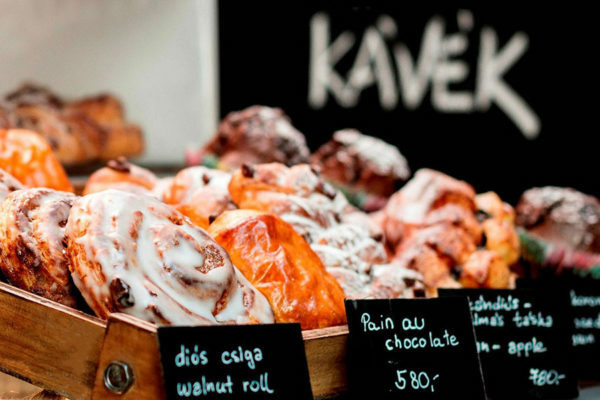 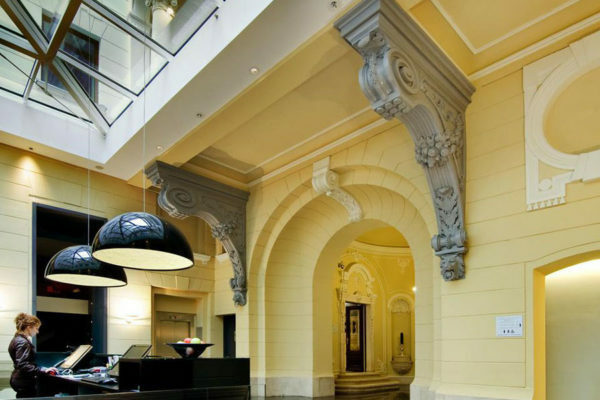 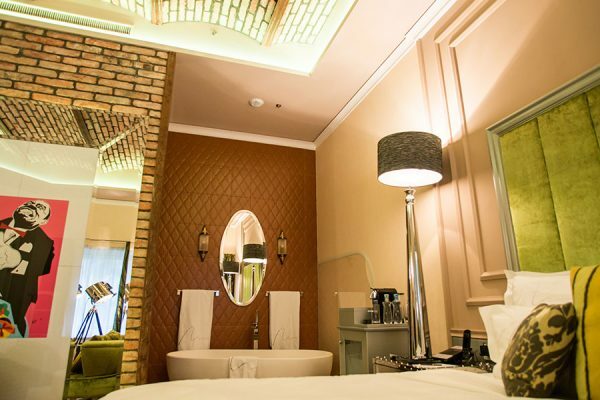 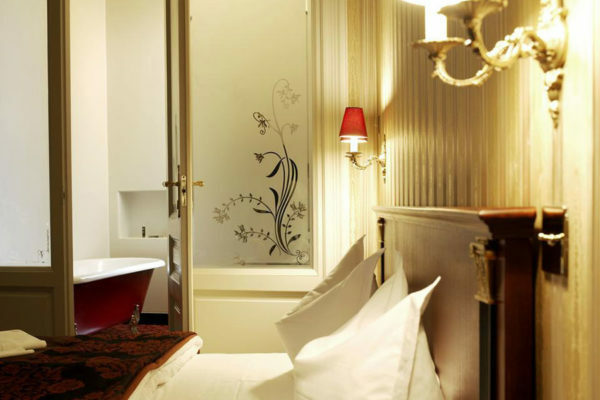 Search for more hotels and accommodations in Budapest! 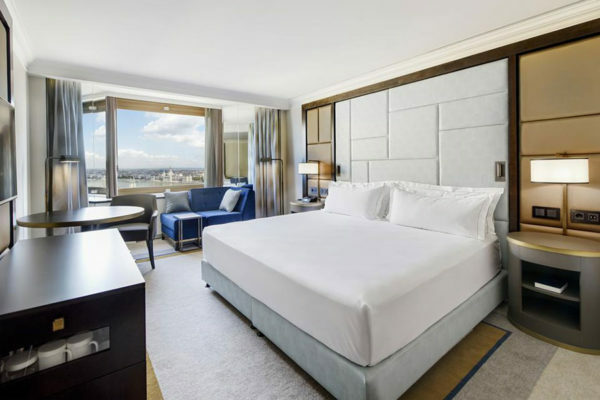 *Disclosure: This page contains affiliate links to booking.com, which means if you click on the buttons and book your accommodation within the same session, we’ll earn a small commission. 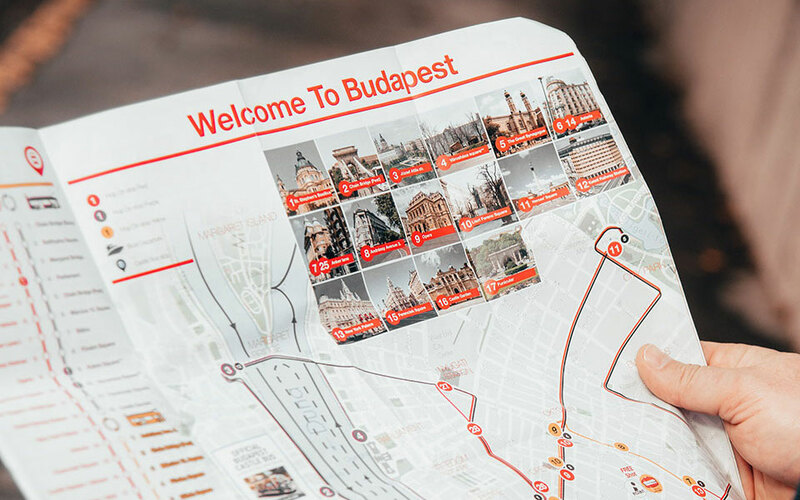 And while you won’t have to pay anything extra, this small commission will make it possible for us to continue publishing more stories on Budapest Local.